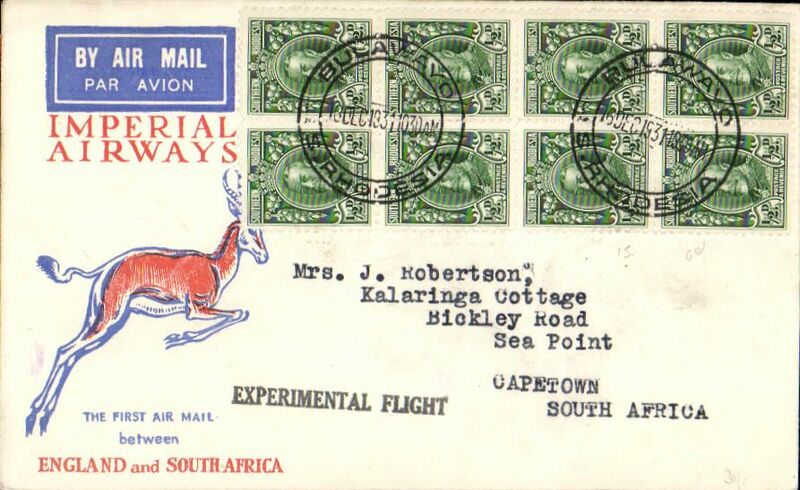 Bulawayo to Cape Town, bs 21/12, carried on Imperial Airways first England-South Africa experimental Christmas flight, Springbok souvenir cover franked 4d, black st line "Experimental Flight" cachet. Written up on album leaf with map of route. 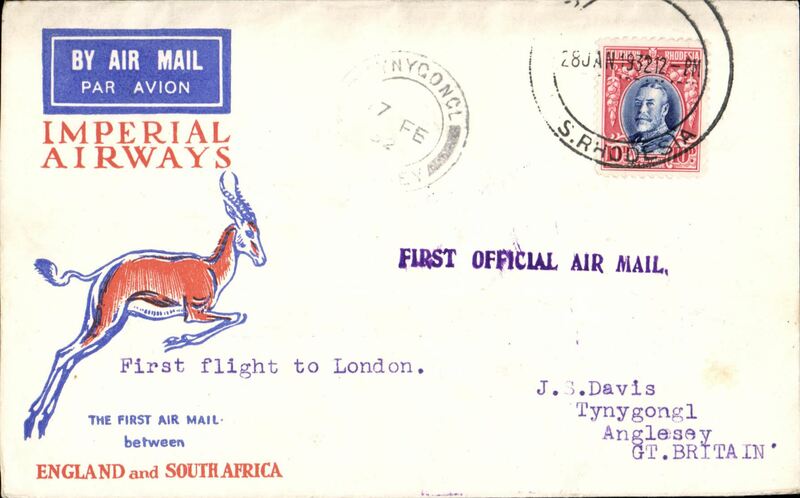 Salisbury to Johannesburg, bs 21/12, carried on Imperial Airways first England-South Africa experimental Christmas flight, Springbok souvenir cover franked 5d, large violet two line "By First Air Mail/From S. Rhodesia" cachet. Written up on album leaf with map of route. Ironed vertical crease, hardly detracts. 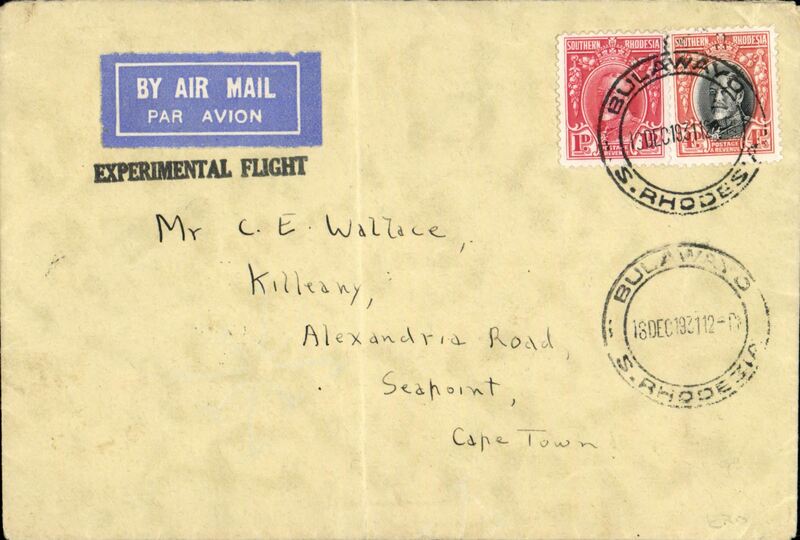 Imperial Airways F/F Salisbury to Cape Town, Springbok cover franked 5d, postmark date not legible, but strong Cape Town 21/12 bs and strong Johannesburg 21/12 transit cds, straight line "Experimental Flight" hs. 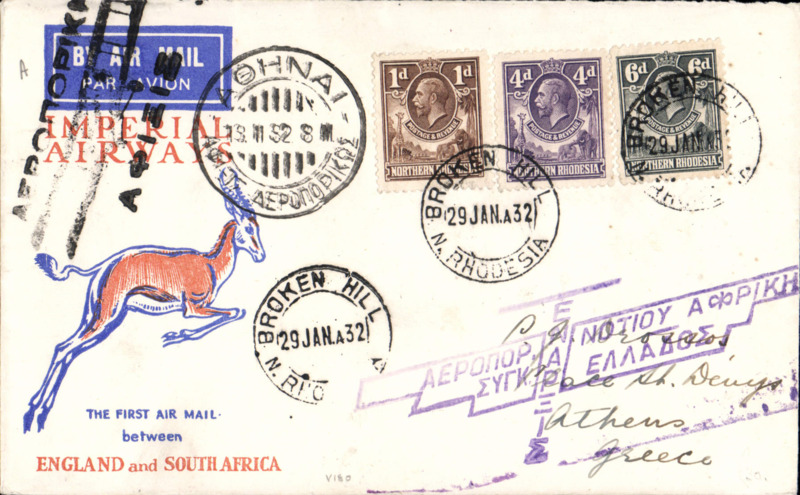 F/F Salisbury to Kimberley, bs 21/12, Victoria West 21/12, via Johannesburg 21/12, Springbok cover franked 5d, violet straight line "Experimental Flight" hs. Carried on Imperial AW Christmas flight to Johannesburg, then by SWA Airways Windhoek-Kimberley feeder service. 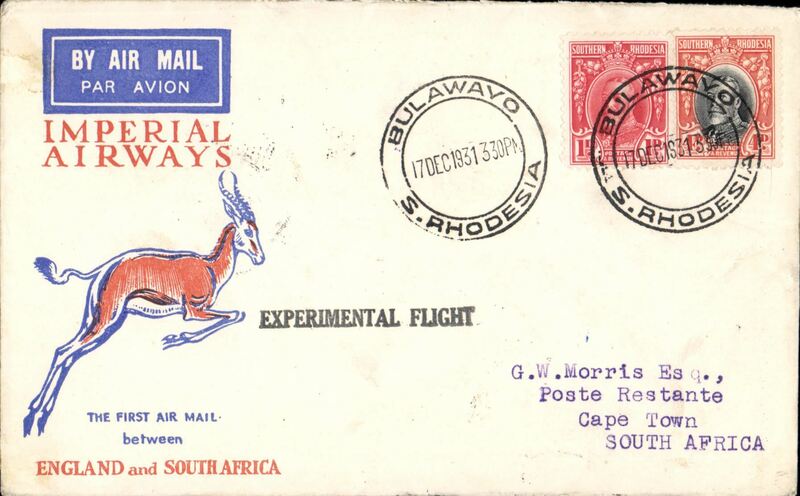 Bulawayo to Cape Town, bs 21/12, carried on Imperial Airways first England-South Africa experimental Christmas flight, Springbok souvenir cover franked 5d, black st line "Experimental Flight" cachet. 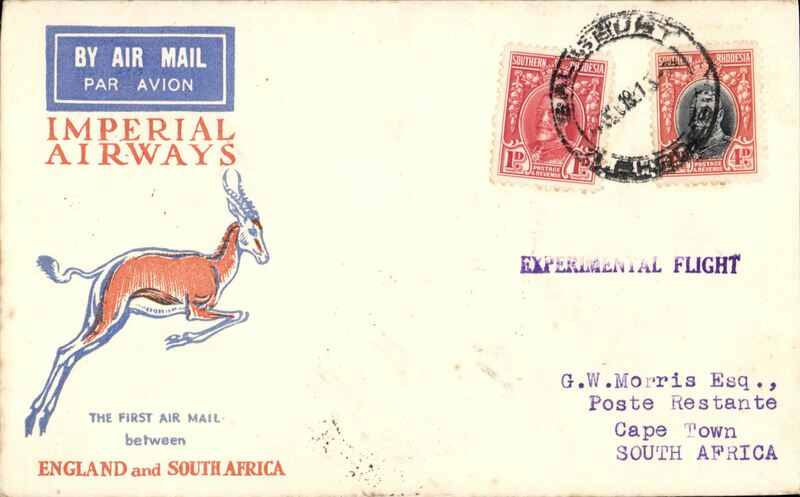 Broken Hill to Cape Town, b/s 21/12, via Jo'burg 21/12, via Johannesburg, 21/12, flown on Croydon-Cape Town Christmas Flight, Springbok cover franked 1/4d, Imperial Airways. 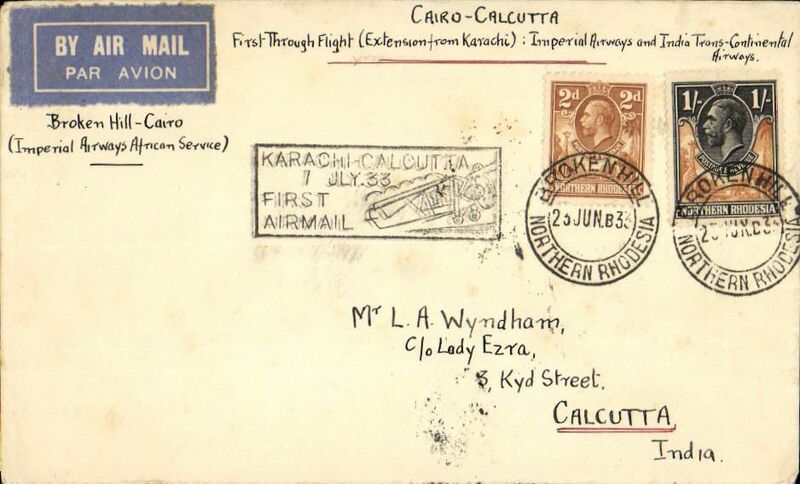 Early airmail from Northern Rhodesia to India, accepted for carriage by air on the Imperial Airways Christmas Flight from London to Cape Town, Broken Hill to Calcutta 16/1/32, via Johannesburg 21/12, attractive Aerophilatelic Club of Calcutta souvenir cover addressed c/o Postmaster, Calcutta, Intally PO, India via Karachi, franked Northern Rhodesia 1/-, canc 'Broken Hill/17 Dec 31' cds. Unusual. Image. 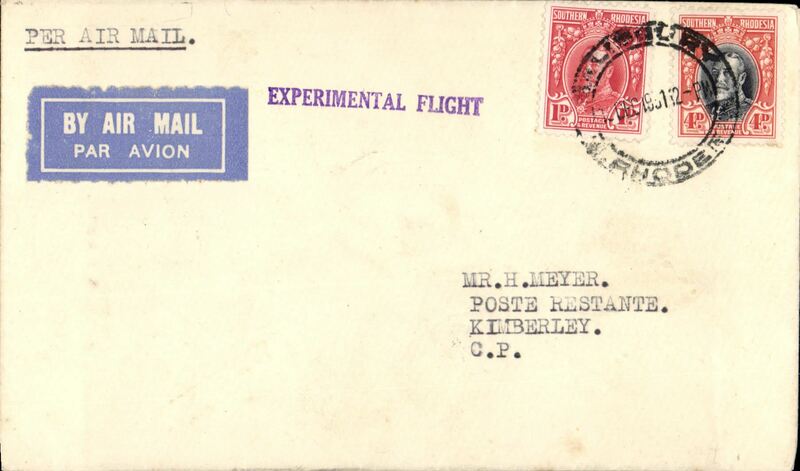 Imperial Airways experimental flight, Salisbury to Kimberley, bs 21/12, violet straight line "Experimental Flight" hs, orange, blue/cream Springbok souvenir cover franked 1/4d, Imperial Airways. 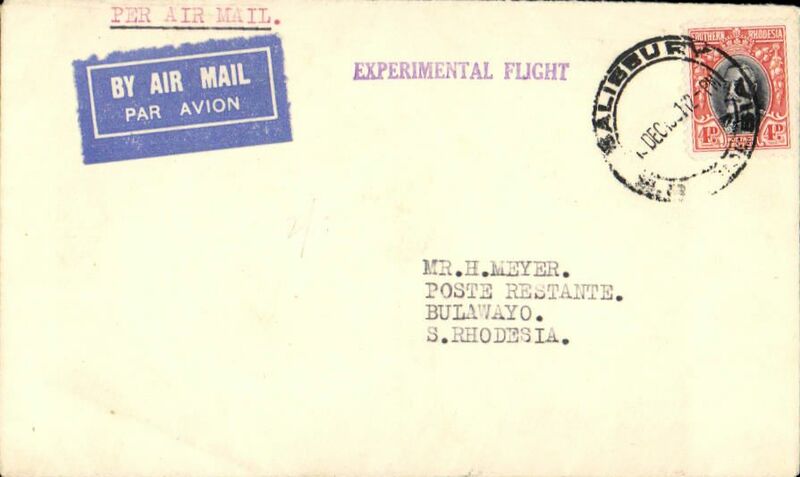 Imperial Airways experimental flight, Bulawayo to Port Elizabeth, bs 22/12, via Johannesburg, bs 21/12, violet straight line "Experimental Flight" hs, orange, plain cover franked 5d, Imperial Airways. Image. 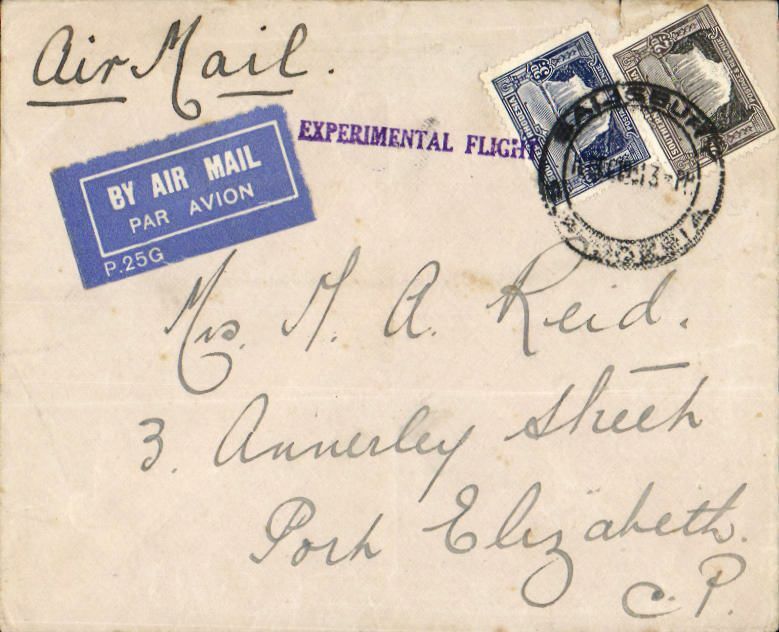 F/F Salisbury to Bulawayo, bs 20/12, airmail etiquette cover franked 4d, violet straight line "Experimental Flight" hs, Imperial Airways. 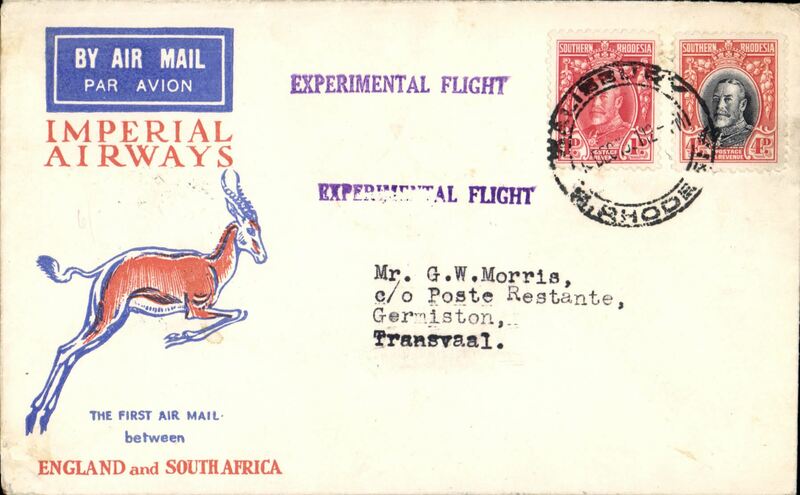 Imperial Airways experimental flight, Bulawayo to Cape Town, bs 21/12, black straight line "Experimental Flight" hs, orange, blue/cream Springbok souvenir cover franked block of 8 x GV 1/2d, Imperial Airways. 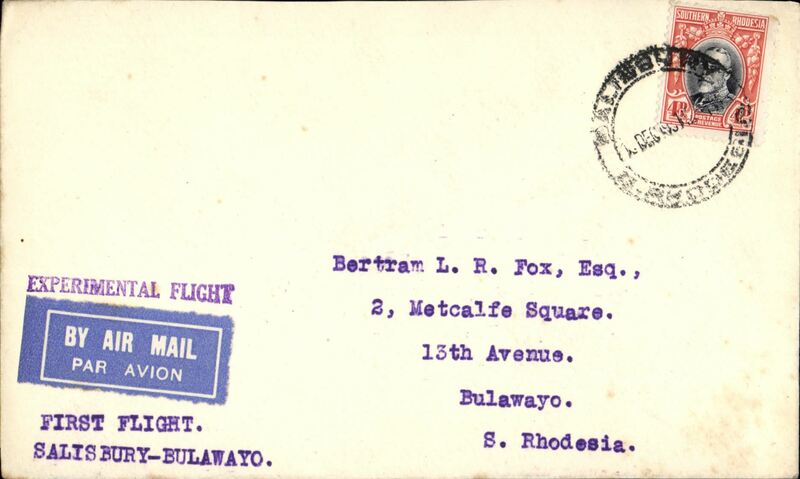 Imperial Airways F/F Salisbury to Bulawayo, bs 20/12, Springbok cover franked 4d, violet straight line "Experimental Flight" hs, typed 'First Flight/Salisbury-Blawayo'. 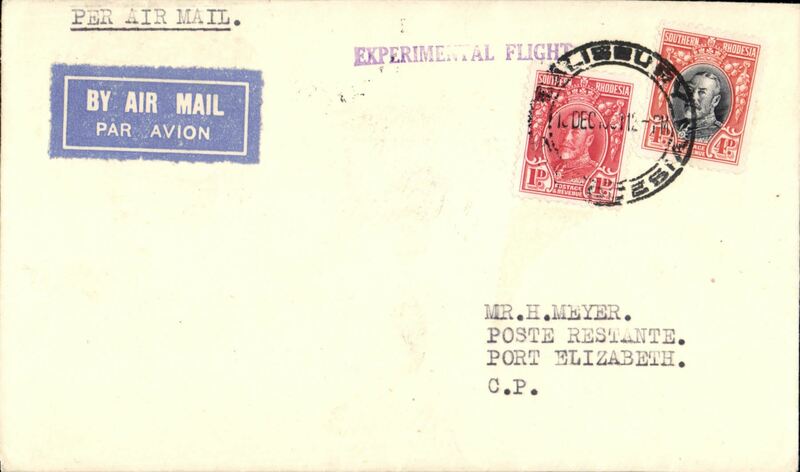 Imperial Airways experimental flight, Bulawayo to Johannesburg, bs 21/12, violet straight line "Experimental Flight" hs, orange, blue/cream Springbok souvenir cover franked 5d, Imperial Airways. 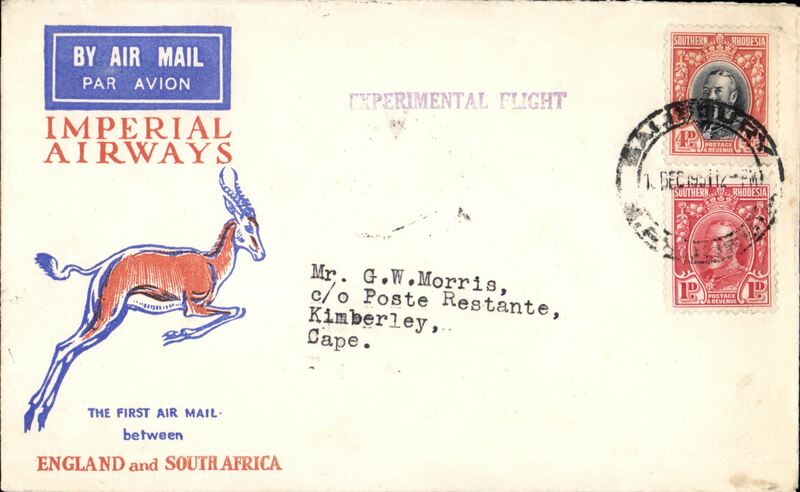 Imperial Airways experimental flight, Bulawayo to Cape Town bs 21/12 via Johannesburg, bs 21/12, violet straight line "Experimental Flight" hs, orange, blue/cream Springbok souvenir cover franked 5d, Imperial Airways. F/F Bulawayo to Mariental (SWA) bs 21/12, via Johannesburg 21/12, carried to Jo'burg, bs 21/12, by IAW and on to Keetmanshoop by SWA, fine strike purple two line 'By First Air Mail/From S. Rhodesia'. Attractive item. 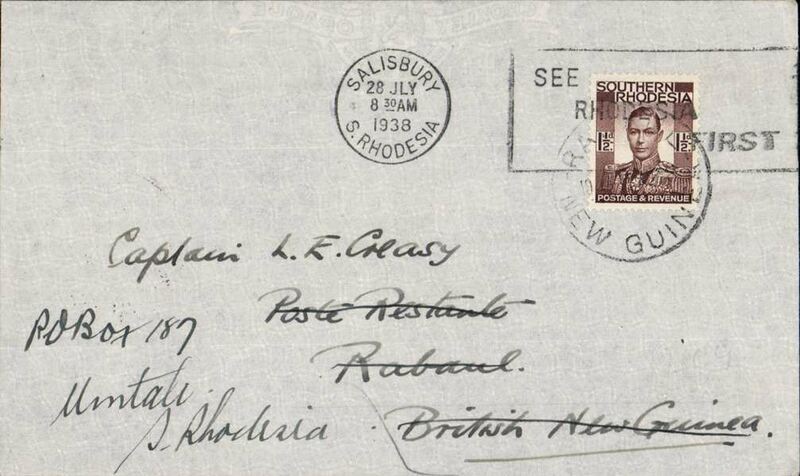 Gatooma-Salisbury 27/2 -London, carried Imperial AW F/F Cape Town-London, plain cover franked 10d, violet F/F cachet. Non invasive ironed vertical crease. See image. 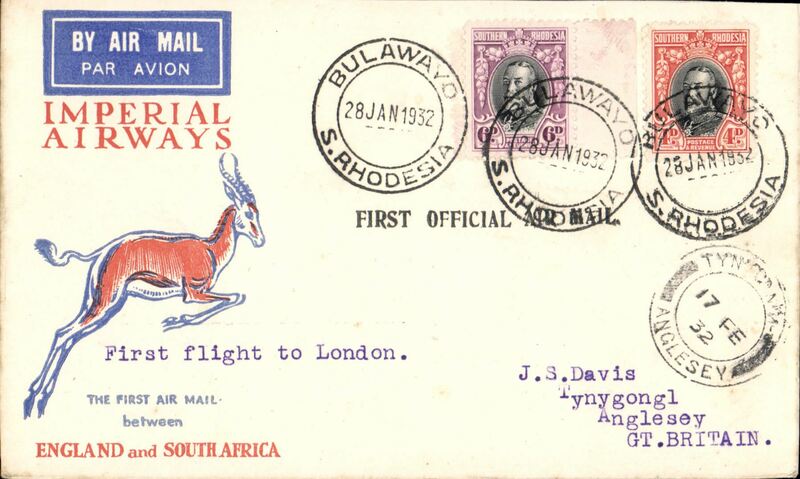 Imperial Airways F/F Bulawayo to Salisbury to Bulawayo, bs 28/1, plain cover franked 4d, black 'First Official Air Mail' cachet. 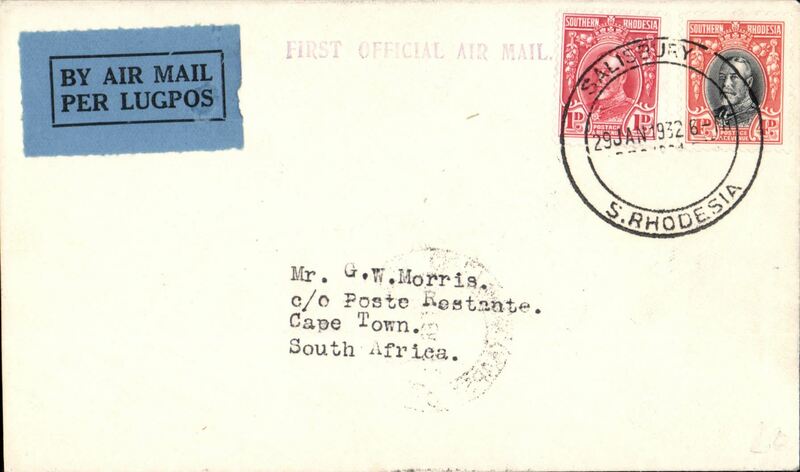 Imperial Airways F/F Salisbury to London, no arrival ds, red/blue/grey official souvenir envelope (20x9cm) from SR with inset picture of Rhodes, carried on 1st regular Cape Town- London service, st. line "First Official Air Mail" cachet. 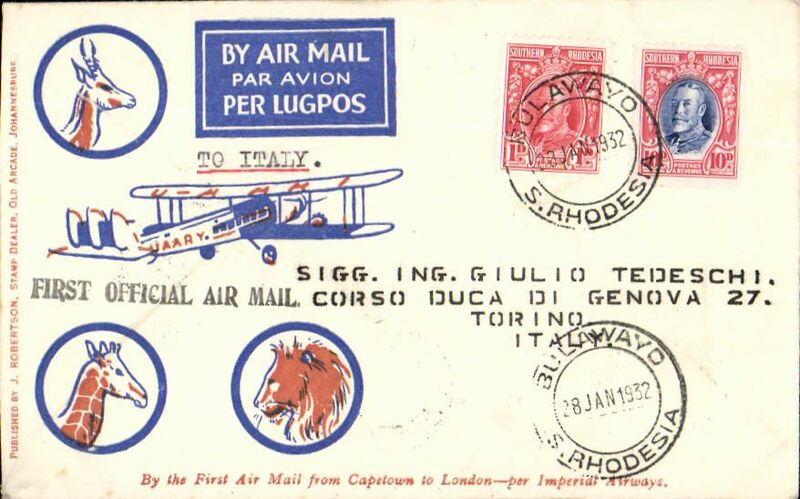 Imperial Airways interrupted flight first flight Salisbury to Turin, Italy bs 16/2, via Cairo 12/2, scarcer Robertson souvenir cover franked 11d, black 'First Official Air Mail' cachet, carried on first regular flight Cape Town-London. En route from Salisbury the City of Delhi had to make an emergency landing due to bad weather near Broken Hill. The mail was transferred to the City of Baghdad, and the mail arrived in Athens 9 days later than scheduled. 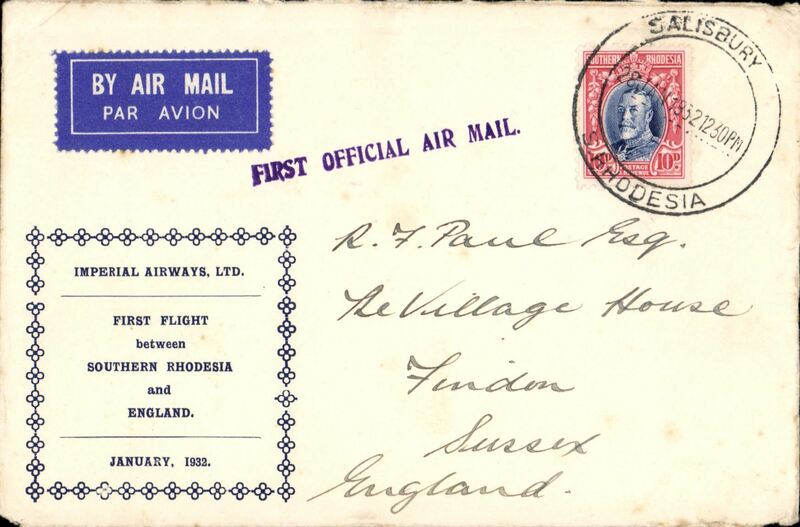 F/F Bulawayo to London, bs Kensington 16/2, carried on 1st regular Cape Town- London service, black st. line "First Official Air Mail" cachet, attractive cover with B&W image of Bulawayo street scene in lower lh corner. 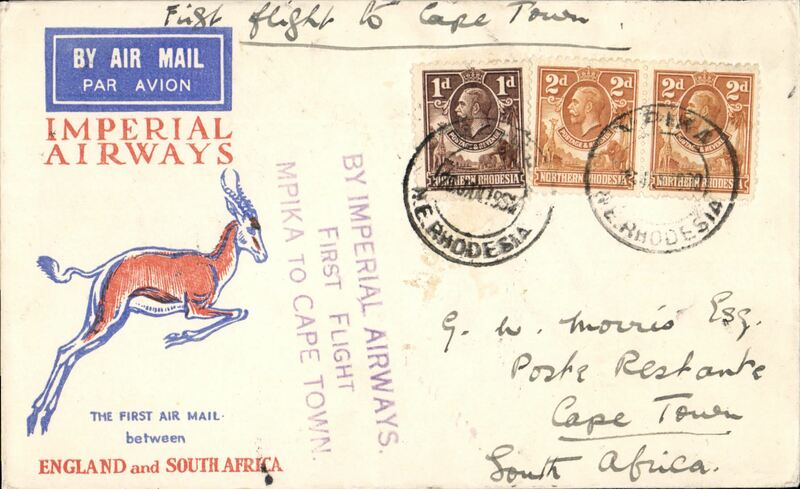 Imperial Airways F/F Mpika to Cape Town, b/s 2/2, carried on first regular flight from London-Cape Town, fine strike violet three line cachet 'By Imperial Airways/First Flight/Mpika to Cape Town', Springbok cover franked KGV 1d, 2d x2. 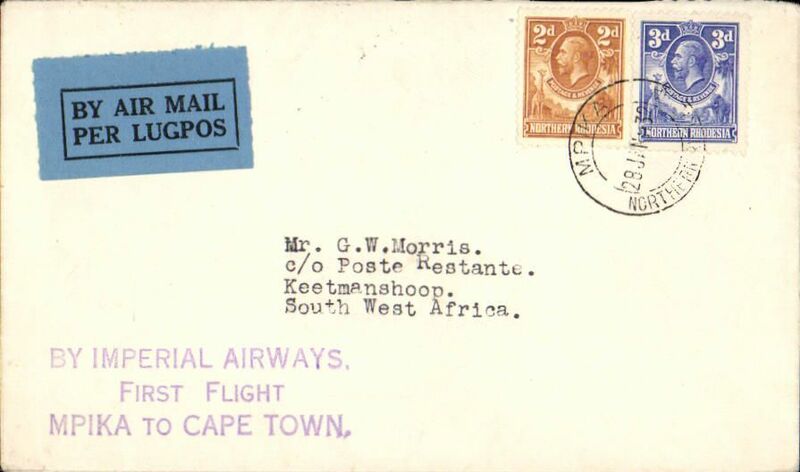 F/F Mpika to Keetmanshoop 8/2, via Kimberley 2/2, carried on the first regular flight from London to Cape Town, plain cover franked KGV 2d, 3d, Imperial Airways. Flight interrupted at Broken Hill. 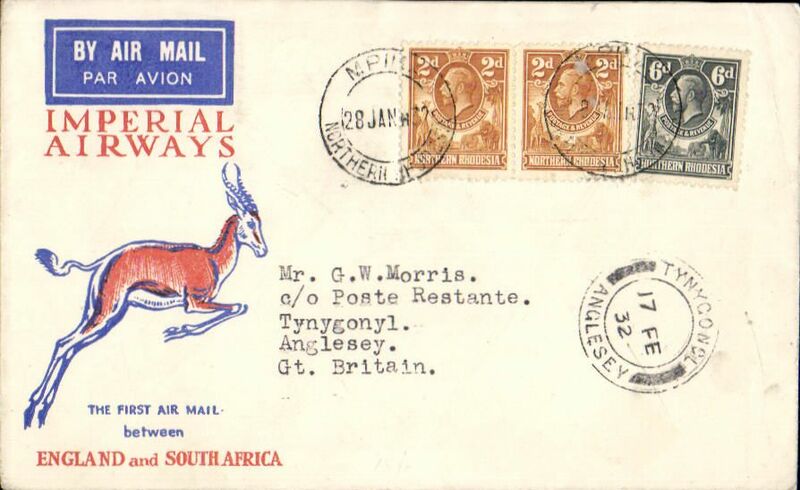 F/F Mpika to London, 17/2 Anglesey arrival ds on front, carried on the first regular flight from Cape Town to London, Springbok souvenir cover franked KGV 6d, 2d x2, Imperial Airways. Flight interrupted at Broken Hill. Imperial Airways interrupted flight first flight Salisbury to London, 17/2 arrival ds on front, Springbok cover franked 10d, canc large '*****/28 Jan 1932/S.Rhodesia (Salisbury), violet st line F/F cachet. Carried on the first regular flight Cape Town-London. En route from Salisbury the City of Delhi had to make an emergency landing due to bad weather near Broken Hill. The mail was transferred to the City of Baghdad, and the mail arrived in Athens 9 days later than scheduled. Imperial Airways interrupted flight first flight Salisbury to London, 17/2 arrival ds on front, Springbok cover franked 10d, violet st line F/F cachet. Carried on the first regular flight Cape Town-London. En route from Salisbury the City of Delhi had to make an emergency landing due to bad weather near Broken Hill. The mail was transferred to the City of Baghdad, and the mail arrived in Athens 13 days later than scheduled. 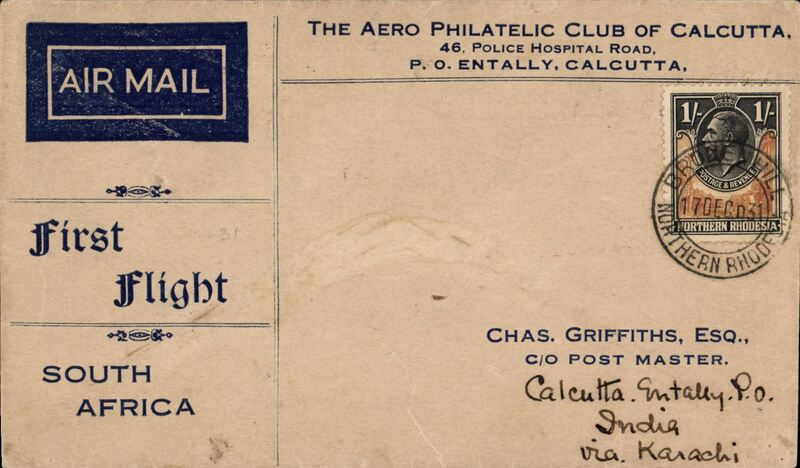 Imperial Airways interrupted flight first flight Salisbury to Athens, 13/2 arrival ds verso, via Alexandria 12/2. 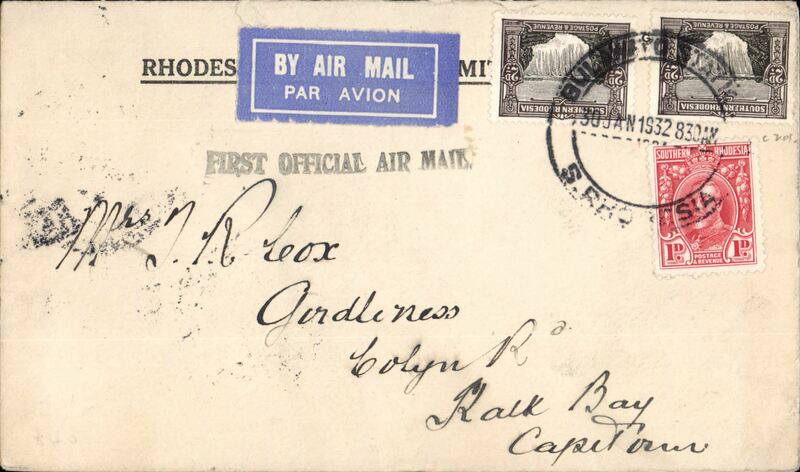 Springbok cover franked 11d, violet 'First Official Air Mail' hs, carried on first regular flight Cape Town-London. En route from Salisbury the City of Delhi had to make an emergency landing due to bad weather near Broken Hill. The mail was transferred to the City of Baghdad, and the mail arrived in Athens 9 days later than scheduled. Sender's address has been excised neatly from flap, Francis Field authentication hs. 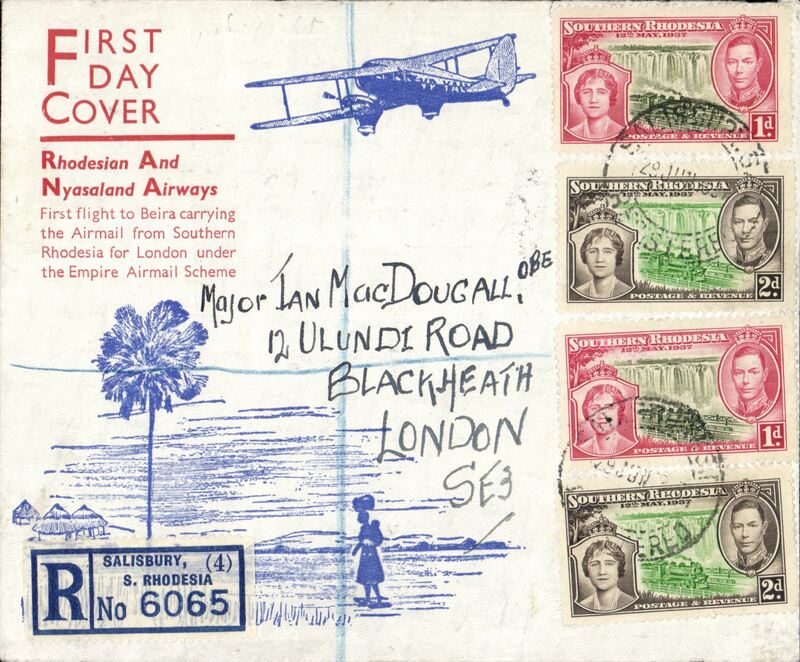 F/F Mpika to London, carried on the first regular flight from Cape Town to London, plain cover franked 2d ordinary plus 8d airmail fee, violet three line 'By Imperial Airways/First Flight/Mpika to London' cachet, Imperial Airways. Flight interrupted at Broken Hill. 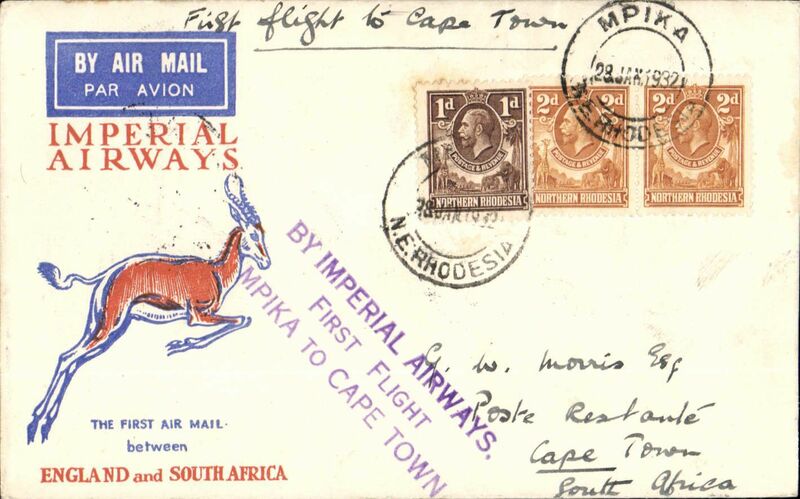 Imperial Airways F/F Mpika to Cape Town, bs 2/2, carried on first regular flight from London-Cape Town, violet three line cachet 'By Imperial Airways/First Flight/Mpika to Cape Town', Springbok cover. 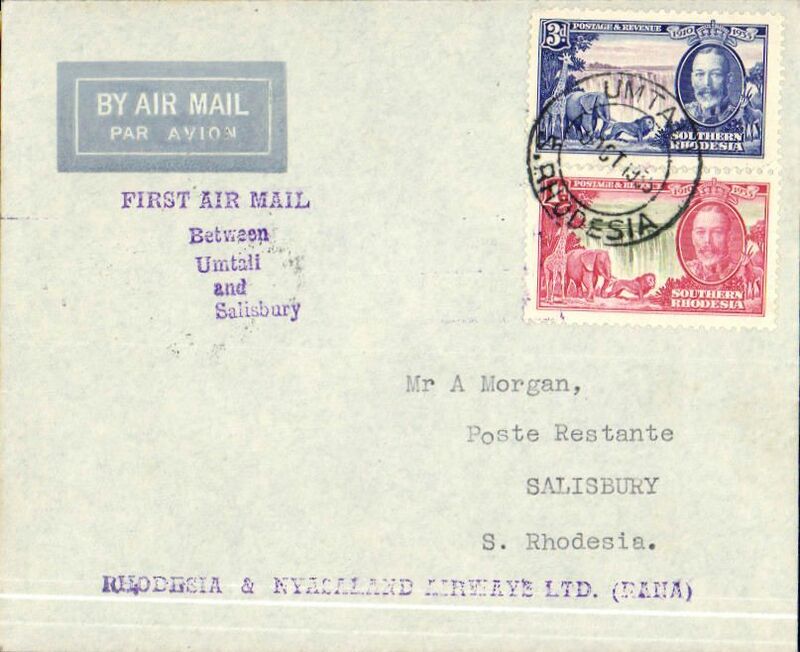 Imperial Airways F/F Salisbury to London, no arrival ds, red/blue/grey official souvenir envelope (20x9cm) from Southern Rhodesia with inset picture of Rhodes, carried on 1st regular Cape Town- London service, st. line "First Official Air Mail" cachet. Slight rough opening visible verso only, see scan. 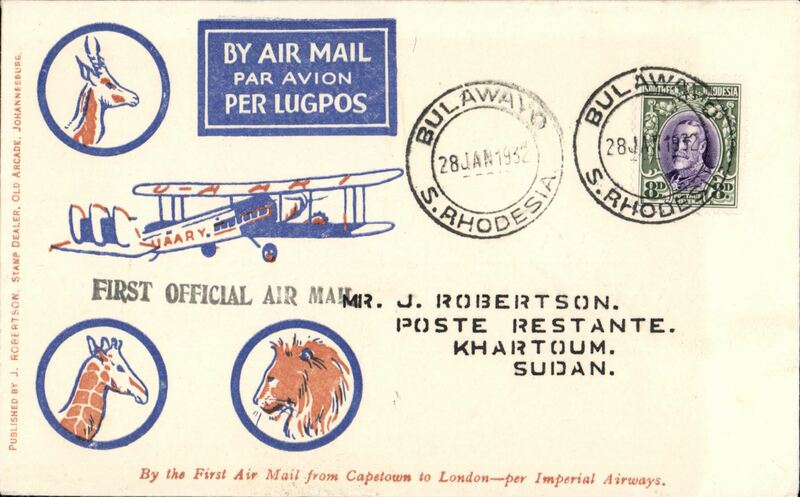 F/F Bulawayo to Khartoum, b/s 10/2, carried on 1st regular Cape Town- London service, st. line "First Official Air Mail" cachet, Robertson cover, Imperial Airways. Small mail, uncommon cover. 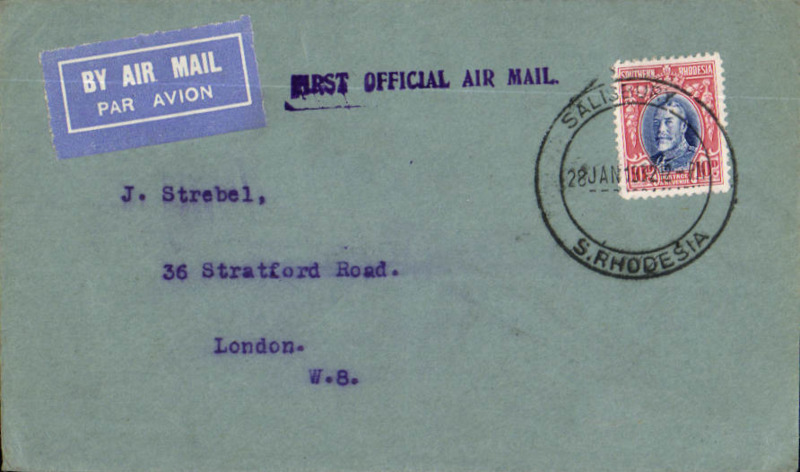 Imperial Airways F/F Salisbury to London, no arrival ds, red/blue/grey official souvenir envelope (20x9cm) from SR with inset picture of Rhodes, carried on 1st regular Cape Town to London service, straight line "First Official Air Mail" cachet. Image. 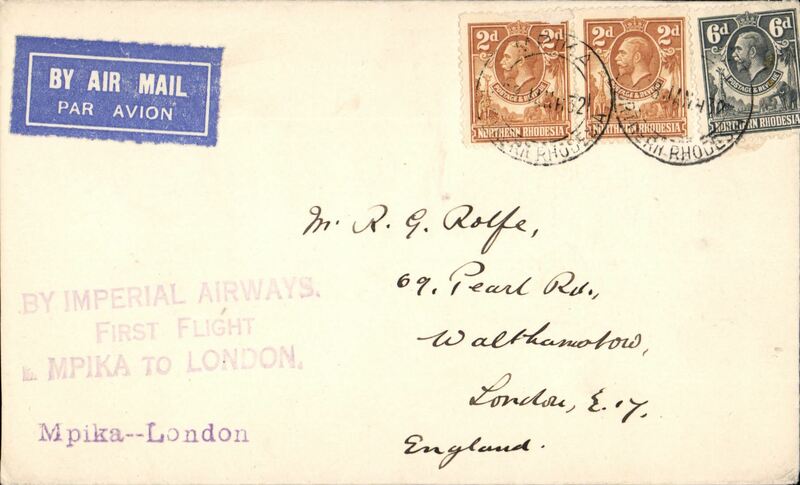 Imperial Airways interrupted flight first flight Salisbury to London, uncommon and attractive souvenir cover franked 10d, Carried on the first regular flight Cape Town-London. En route from Salisbury the City of Delhi had to make an emergency landing due to bad weather near Broken Hill. The mail was transferred to the City of Baghdad, and the mail arrived in Athens 13 days later than scheduled. Interesting. 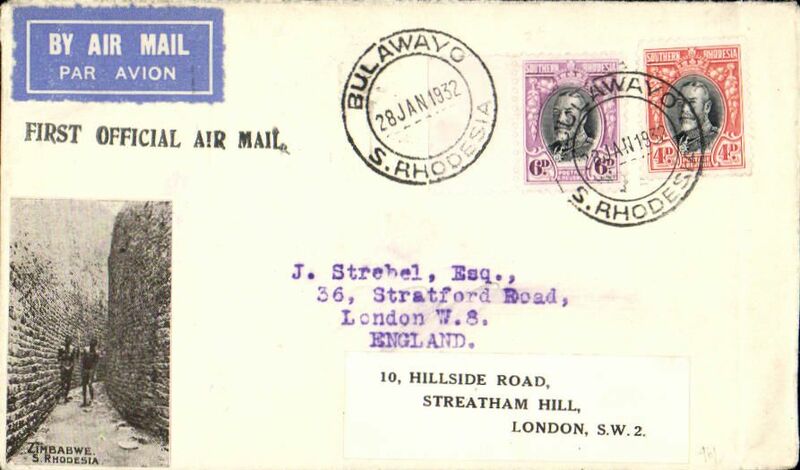 F/F Bulawayo to Salisbury, bs 28/1, carried on 1st regular Cape Town to London service, black st. line "First Official Air Mail" cachet, plain cover franked 4d. 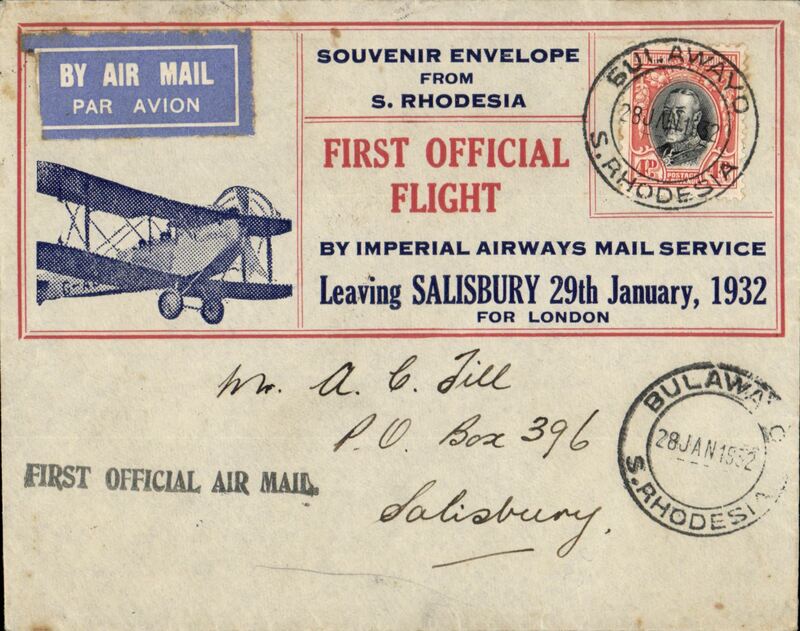 F/F Bulawayo to Salisbury, bs 28/1, carried on 1st regular Cape Town to London service, black st. line "First Official Air Mail" cachet, attractive red/grey/blue souvenir cover with biplane and 'First Official Flight/Leaving Salisbury 29th January, 1932', franked 4d. 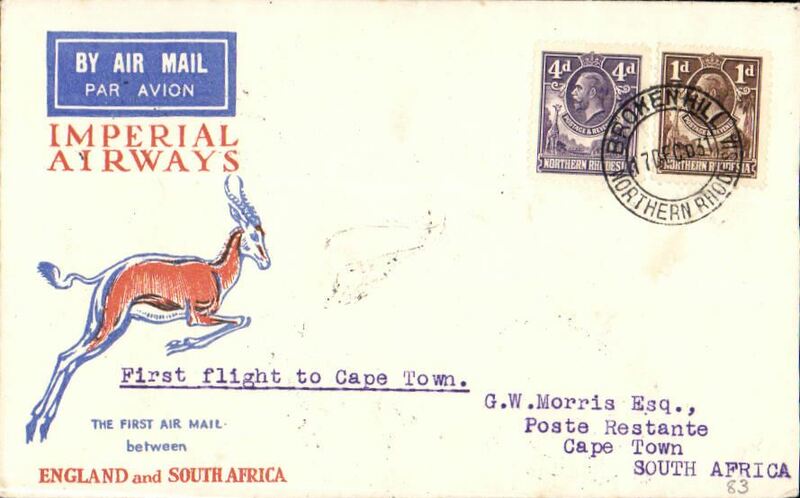 F/F Bulawayo to Cape Town, bs 2/1, via Jo'burg 1/2, carried on 1st regular Croydon-Cape Town service, black Bulawayo st. line "First Official Air Mail" cachet, Imperial Airways. Some flap loss verso. 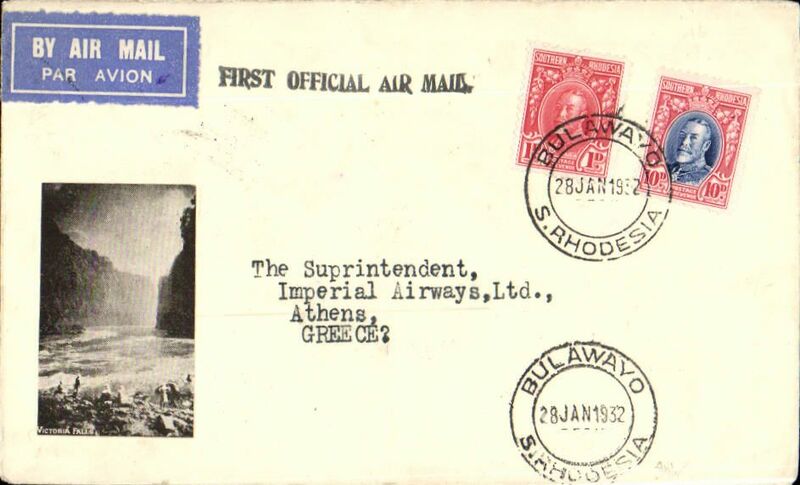 Scarce accelerated emergency mail, Imperial Airways inaugural Cape Town-London service, carried by 'City of Baghdad' from Broken Hill to Athens, bs 13/2, via Nairobi 3/2 transit cds verso, blue/orange/white Robertson souvenir cover franked 11d, canc Broken Hill 29 Jan 1932 cds. Due to the delay of the ill fated first service from Cape Town, the 'City of Baghdad' waited at Broken Hill until February 2nd, when it took off via Mpika, Dodoma, and Moshi, arriving Nairobi 3/2. This accelerated emergency mail, backstamped between February 2nd and 4th is of considerable rarity, and of unusual interest to aerophilatelists in that it anticipated the first mails from points south of Broken Hill by several days.. 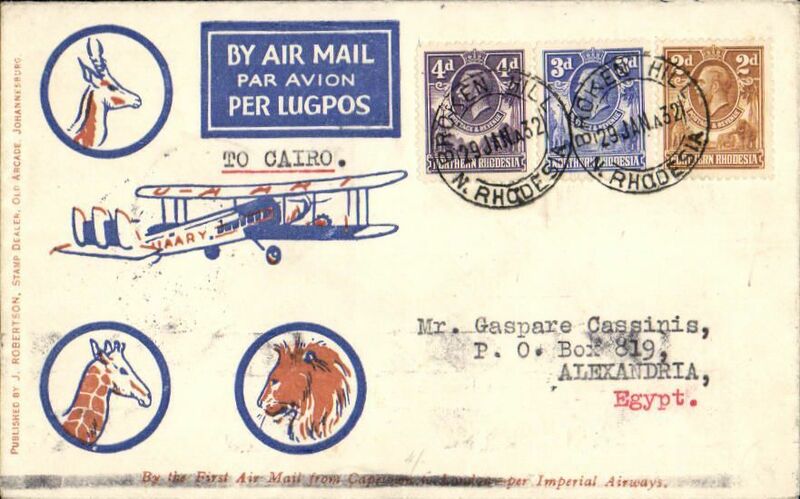 Scarce accelerated emergency mail, Imperial Airways inaugural Cape Town-London service, carried by 'City of Baghdad' from Broken Hill to Nairobi 3/2 transit cds verso, where it waited for the second Cape Town-London flight for OAT to Alexandria, bs 13/2, orange/white Springbok souvenir cover franked KGV 2d, 3d, 4d, canc Broken Hill 29 Jan 1932 cds. The flight from Cape Town was interrupted twice, first when a wheel was damaged on take off from Salisbury, and again when bad weather forced the plane to land in a swamp near Broken Hill, ref Ni 320129 and 320129B. The 'City of Baghdad' waited at Broken Hill until February 2nd, when it took off via Mpika, Dodoma, and Moshi, arriving Nairobi 3/2. This accelerated emergency mail, back stamped between February 2nd and 4th is of considerable rarity, and of unusual interest to aerophilatelists. 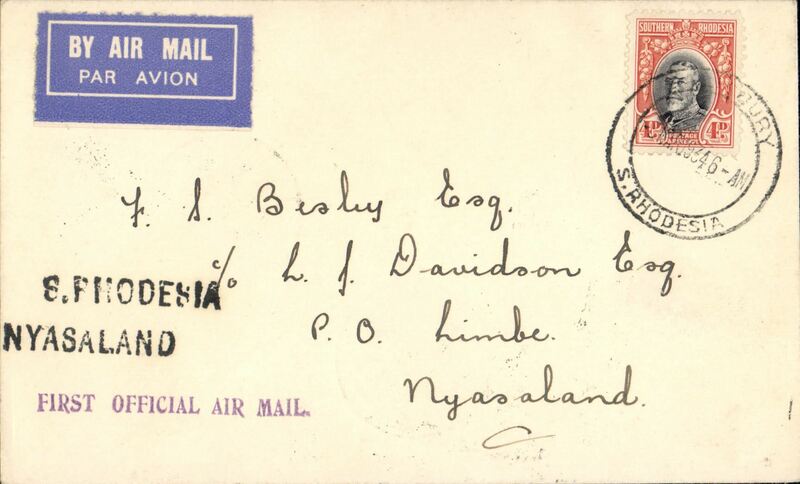 RANA F/F Salisbury to Blantyre, b/s, black two line "S Rhodesia Nyasaland" hs's, official souvenir cover with trimotor silhouette franked 4d. 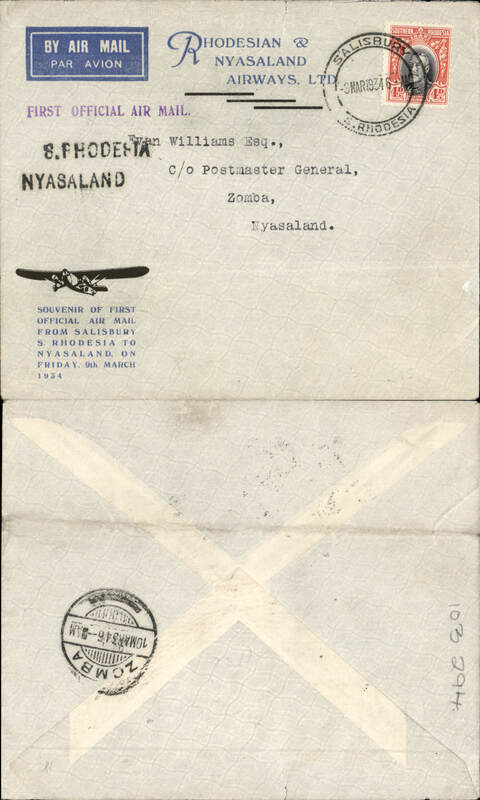 RANA F/F Salisbury to Zomba, bs 10/3, black two line "S Rhodesia Nyasaland" hs's, official souvenir cover with trimotor plane and text franked 4d. Ironed horizontal crease and 5mm non invasive closed top edge tear. 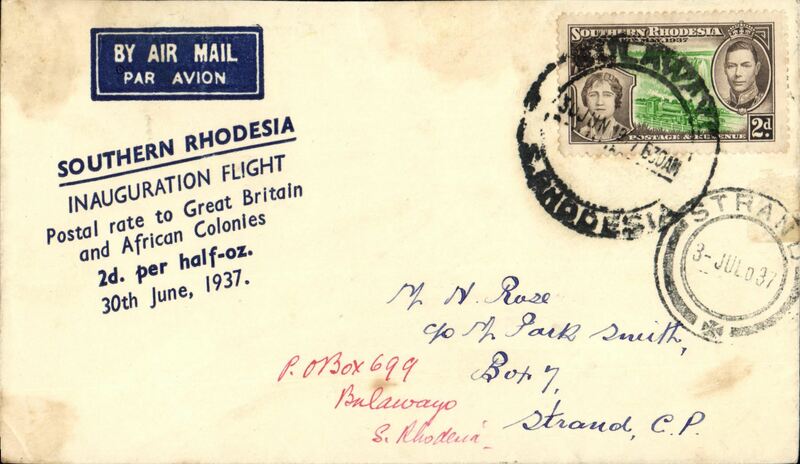 RANA F/F Salisbury to Zomba, bs 10/3, black two line "S Rhodesia Nyasaland" hs's, violet 'First Official Air Mail' hs, plain cover with franked 4d. 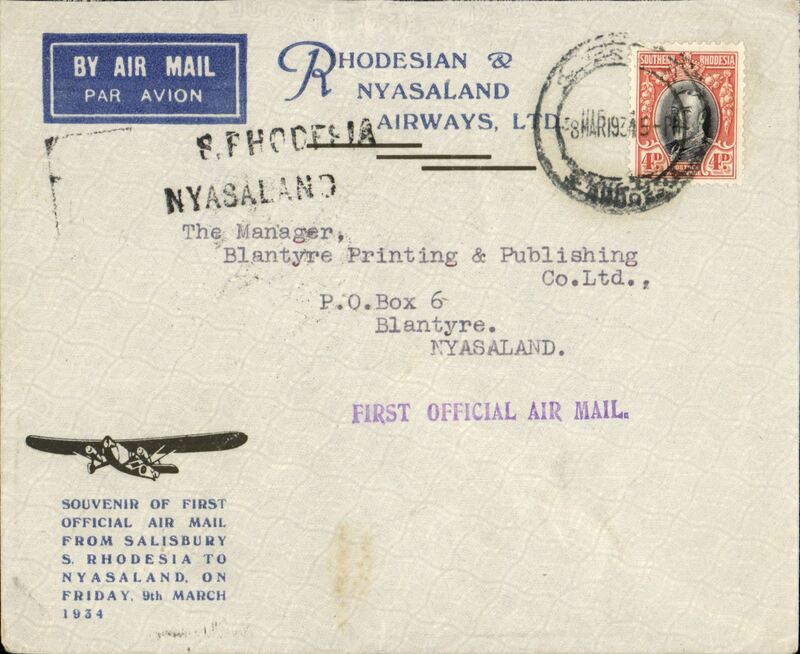 RANA F/F Salisbury to Blantyre, bs 9/3, black two line "S Rhodesia Nyasaland" hs's, violet 'First Official Air Mail', official souvenir cover with trimotor silhouette franked 4d. 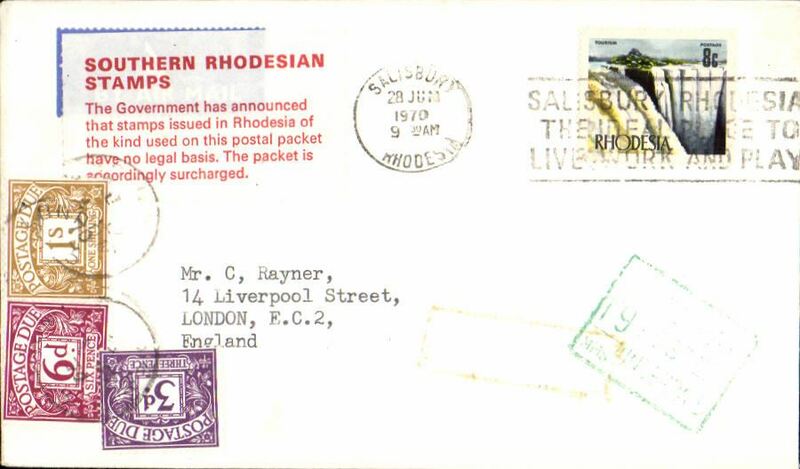 RANA F/F Salisbury to Blantyre, bs 9/3, plain cover franked 4d, black two line 'S.Rhodesia/Nyasaland' and purple 'First Official Air Mail' cachets. 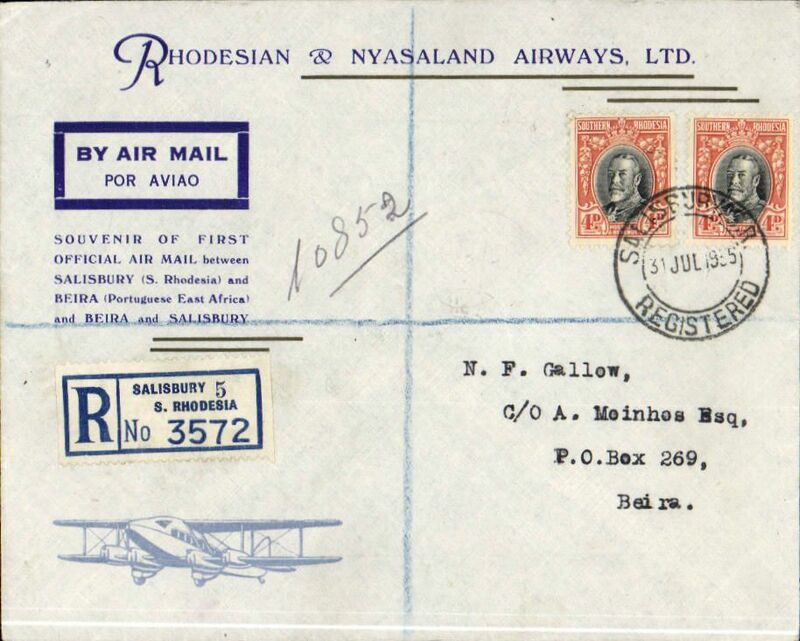 RANA, F/F Salisbury to Limbe, Nyasaland, bs 9/3, via Blantyre 9/3, plain etiquette cover franked 4d, violet straight line "First Official Air Mail" and black two line "S Rhodesia Nyasaland" cachets. Very fine. 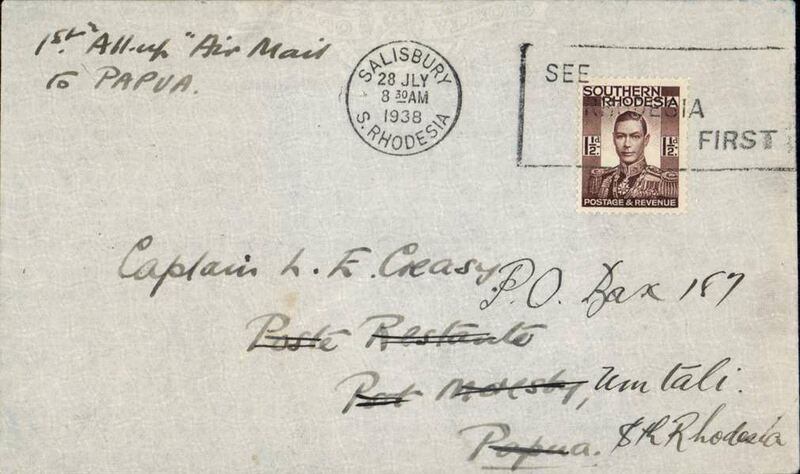 RANA, F/F Salisbury to Blantyre, bs 9/3, plain cover etiquette franked 4d, violet straight line "First Official Air Mail" and black two line "S Rhodesia Nyasaland" cachets. Typed up on album page with map of route. 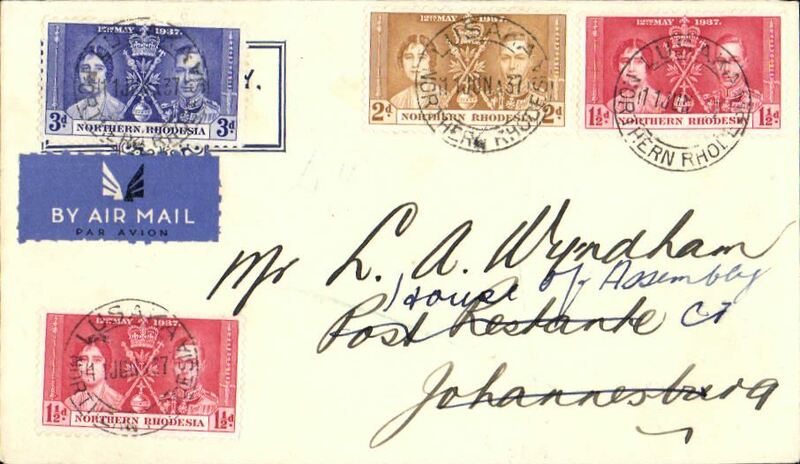 Royal Tour of Southern Rhodesia, flown to Bulawayo bs 28/3, Robertson cover franked Victoria Falls 2d and 3d, each cancelled with fine strike of souvenir 'crested crown' postmark dated 27 III 34. 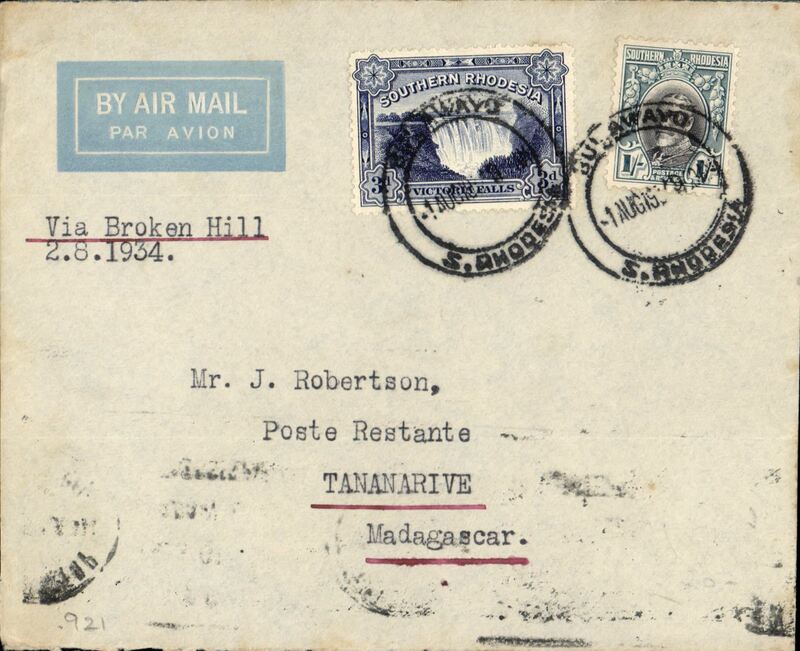 F/F, Broken Hill to Quelimane, bs 2/8, French feeder service to Madagascar, typed endorsement "Via Broken Hill Air Mail 2/8/34" plain Robertson cover, franked 10d, Service de la Navigation de Madagascar. Flown by Assolant and Lefevre, flight interrupted by accident between Broken Hill and Tete. Scarce. 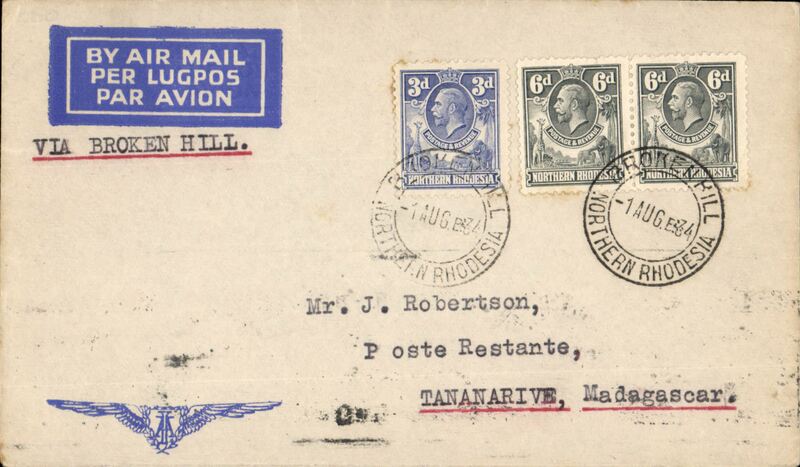 First dispatch of mail from S. Rhodesia to Madagascar, Bulawayo to Majunga, bs 9/8, via Tananarive 4/8, Imperial Airways 'winged logo' cover with Robertson hs on flap, franked 1/3d, typed "Via Broken Hill". Carried by Imperial AW to Broken Hill, then by LeFevre and Assolant on the new Franco-Belgian 'Broken Hill-Madagascar' service. For good references see Morton 2005. 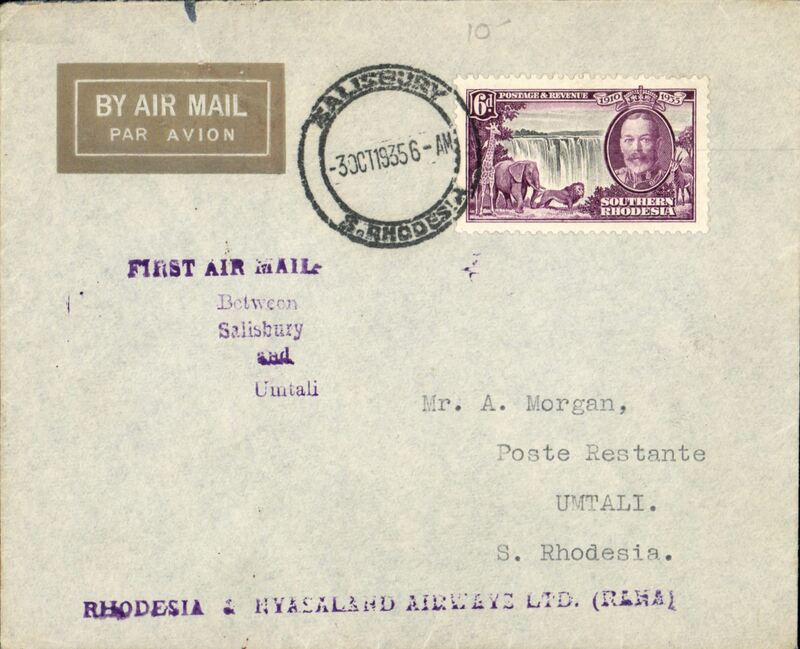 First dispatch of mail from S. Rhodesia to Portuguese East Africa, Bulawayo to Tananarive b/s 4/8, Imperial Airways 'winged logo' cover, franked 1/3d, typed "Via Broken Hill". Carried by Imperial AW to Broken Hill, then by LeFevre and Assolant on the new Franco-Belgian 'Broken Hill-Madagascar' service. For good references see Morton 2005. 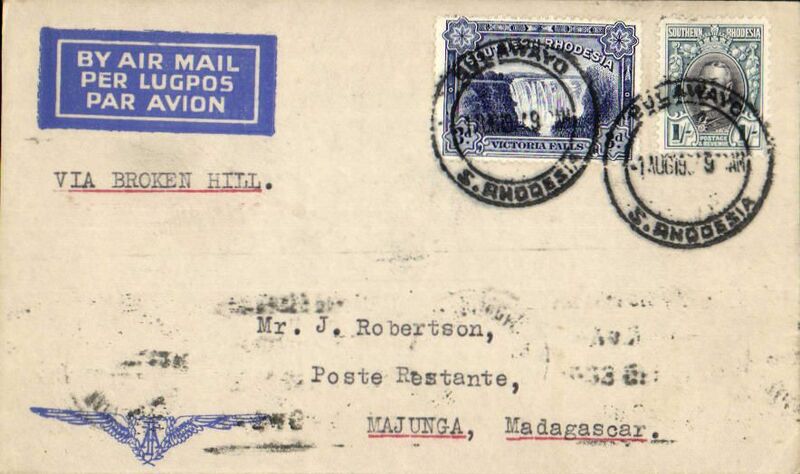 First dispatch of mail from S. Rhodesia to Portuguese East Africa, Bulawayo to Tananarive b/s 4/8, Imperial Airways 'winged logo' cover with Robertson hs on flap, franked 1/3d, typed "Via Broken Hill". Carried by Imperial AW to Broken Hill, then by LeFevre and Assolant on the new Franco-Belgian 'Broken Hill-Madagascar' service. For good references see Morton 2005. Salisbury to Australia, bs Perth 21/12, first acceptance of African 'all the way' airmail for Australia for carriage on the Imperial Airways African service to Cairo, 10/12 transit cds, to connect with the first extension of the IA/ITCA/Qantas service from Singapore to Brisbane, official 'Kangaroo' cover franked 1/8d canc Salisbury cds. 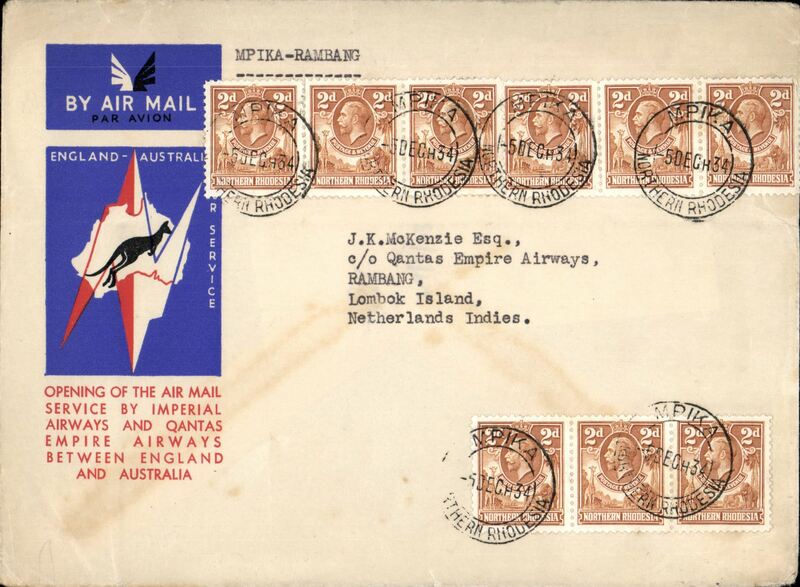 Northern Rhodesia acceptance for Australia, Mpika to Lombok Island,NEI, bs 20/12, via Cairo 10/12, carried on F/F IAW extension of London-Singapore service to Australia, franked 1/6d, red/white/blue official Imperial Airways/Qantas cover. Scarce item in fine condition. 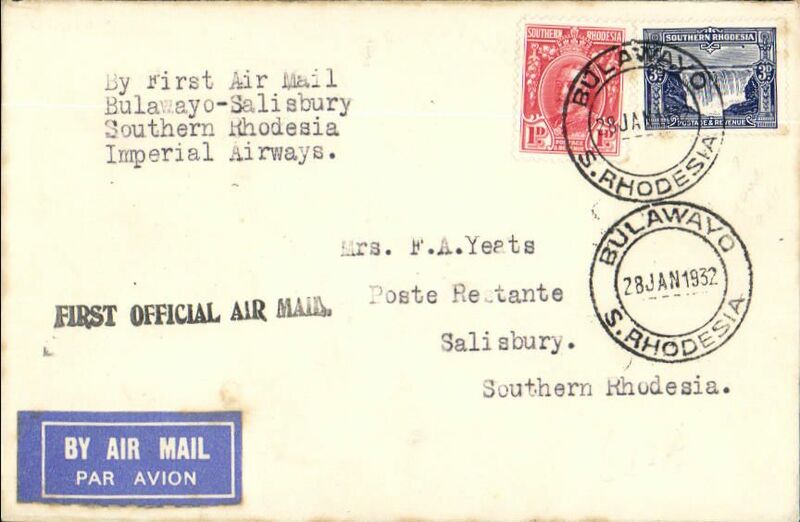 First acceptance of mail for Australia from Southern Rhodesia for carriage on Imperial Airways inaugural extension of the London-Singapore service to Australia, Salisbury to Sydney, bs 21/12, via Cairo 10/12, plain airmail etiquette cover franked 1/8d, canc Salisbury cds, ms 'First Direct Air Mail S. Rhodesia to Australia'. Scarce acceptance, great routing. 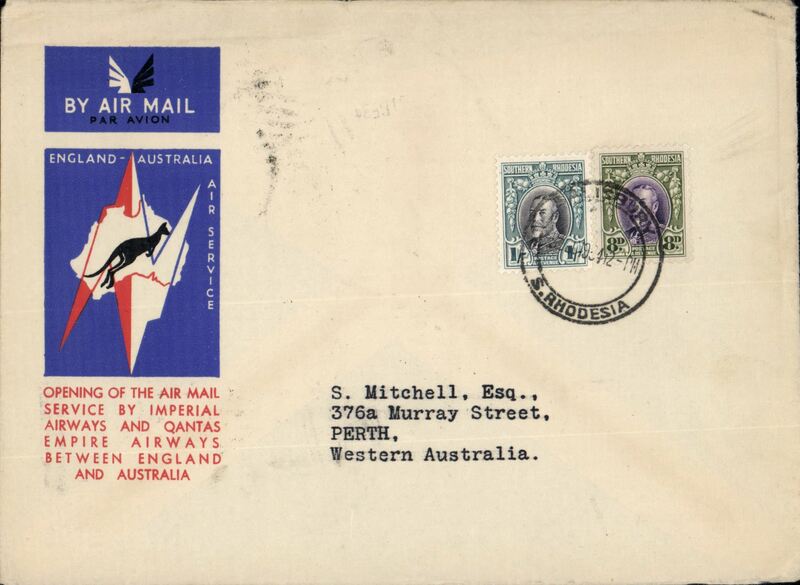 Northern Rhodesia first acceptance for Australia for carriage on the F/F ImperialAirways/Qantas extension of the London-Singapore service, attractive red/cream Wyndham 1d 1/2d PSC uprated to 10 1/2d canc Bulawayo Dec 5 34 cds, in excellent condition. Scarce, PC's particularly so. 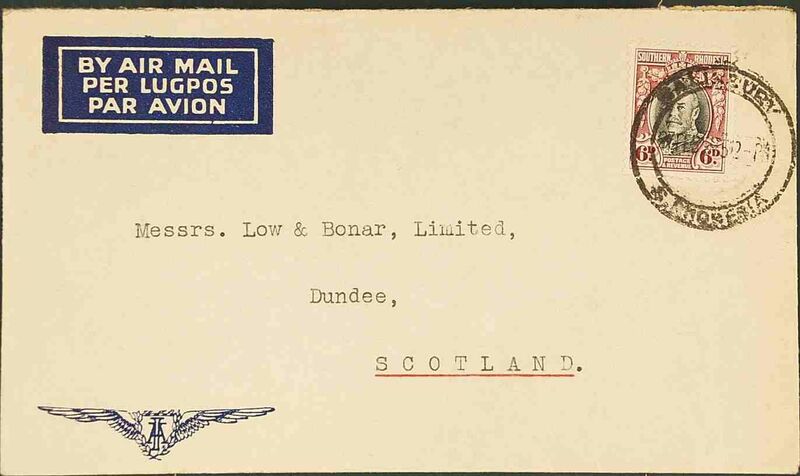 Imperial Airways, Salisbury to Scotland, no arrival ds, Imperial Airways imprint etiquette cover with winged logo in corner from the South African Canvas Company Ltd, franked KGV 6d, carried on the Cape Town-Croydon service. 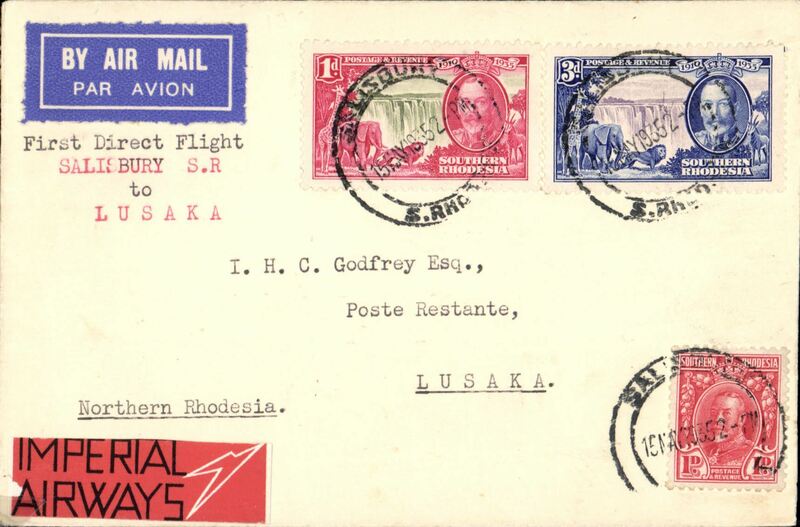 Imperial Airways first direct flight from Southern Rhodesia to Northern Rhodesia, Salisbury to Lusaka, bs 19/5, Godfrey airmail etiquette cover, franked 5d, canc Salisbury cds, typed "First Direct Air Mail between/Salisbury S.R./to Lusaka', uncommon red/black 'Imperial Airways' logo label on front. Francis Field authentication hs verso. 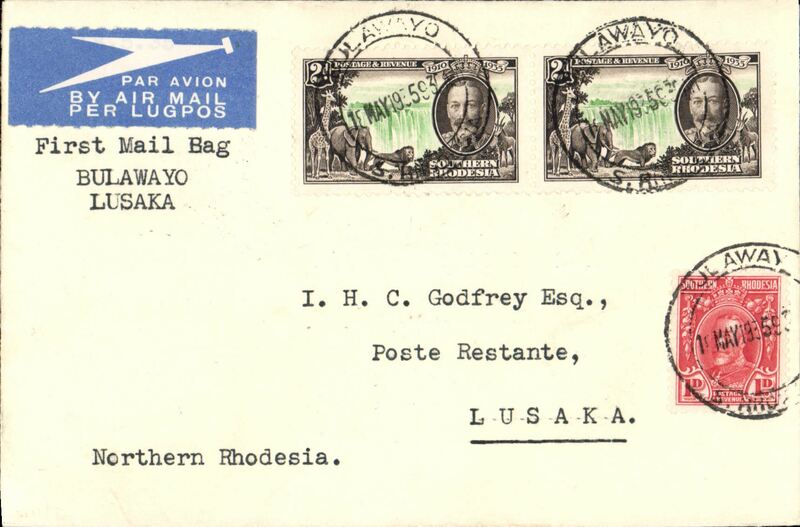 Imperial Airways first direct flight from Southern Rhodesia to Northern Rhodesia, Bulawayo to Lusaka, bs 19/5, Godfrey airmail etiquette cover, franked 5d, canc Bulawayo cds, typed "First Mail Bag/Bulawayo/Lusaka'. Francis Field authentication hs verso. 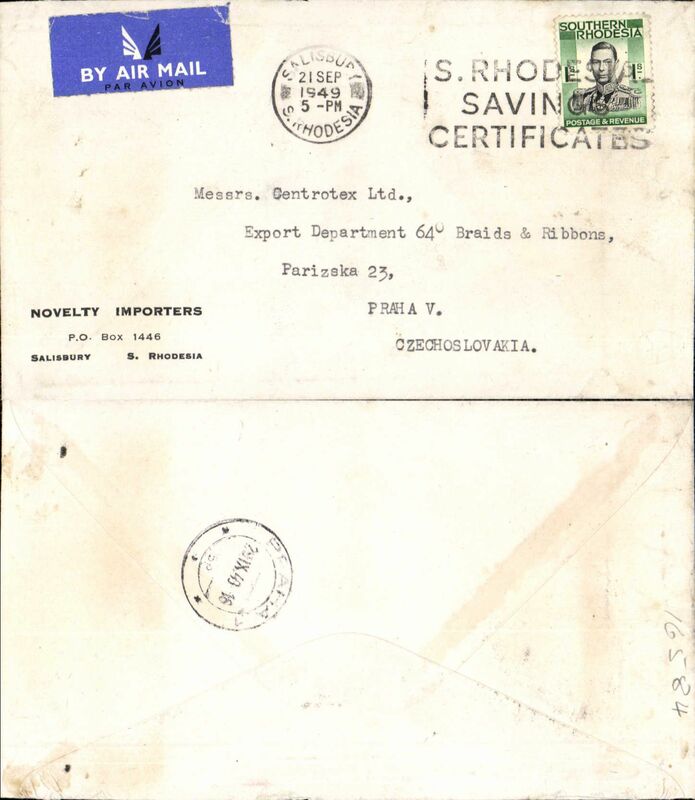 F/F Salisbury to Beira, bs 4/8, registered (label) official cover inc picture of Leopard Moth front and larger version verso, Rhodesia and Nyasaland Airways, also original Registered Letter slip. Nice item. Northern Rhodesia to Southern Rhodesia, Lusaka to Umtali, bs 3/10, Northern Rhodesia acceptance for RANA F/F Salisbury to Umtali, attractive Imperial Airways attractive embossed wing' corner cover, franked N. Rhodesia Silver Jubilee set of 4, typed "Per Imperial Airways/Lusaka to Salisbury" and "per RANA Salisbury to Umtali (First Flight). 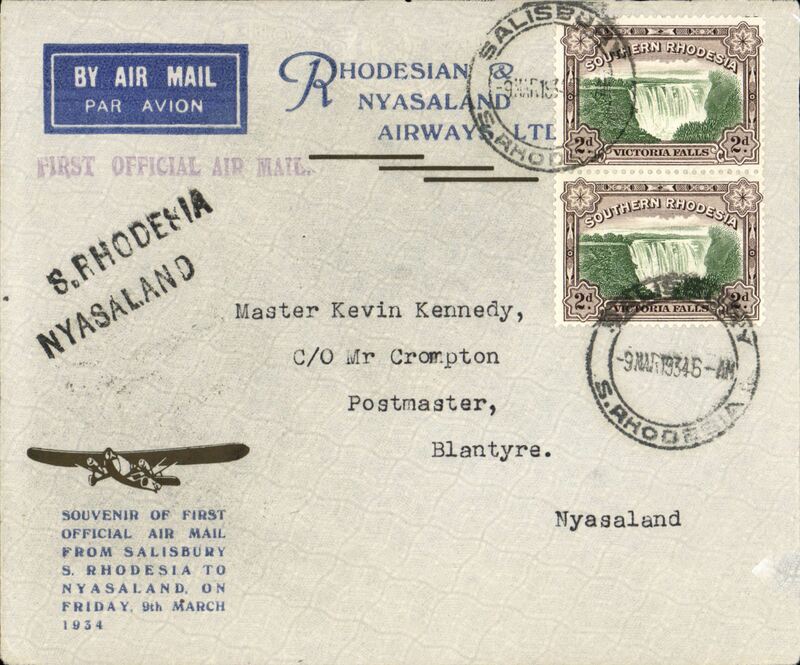 Rhodesia and Nyasaland Airways, F/F internal flight, Salisbury to Umtali, bs 3/10, on Salisbury-Beira route, b/s 5/10, Wyndham cover franked 4d, canc Salisbury cds, etiquette, typed 'First Air Mail Flight/Salisbury to Umtali'. 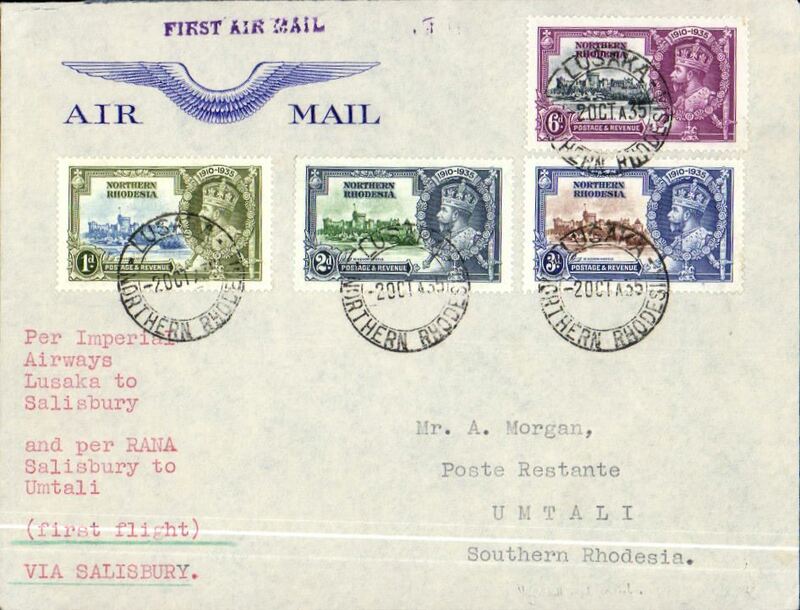 Rhodesia and Nyasaland Airways, F/F internal flight, Salisbury to Umtali, bs 3/10, attractive gold imprint etiquette airmail cover franked 6d, canc Salisbury cds, violet five line 'First Air Mail/Between/Salisbury/and/Umtali' and single line 'Rhodesia & Nyasaland Airways Ltd (RANA)' cachets. 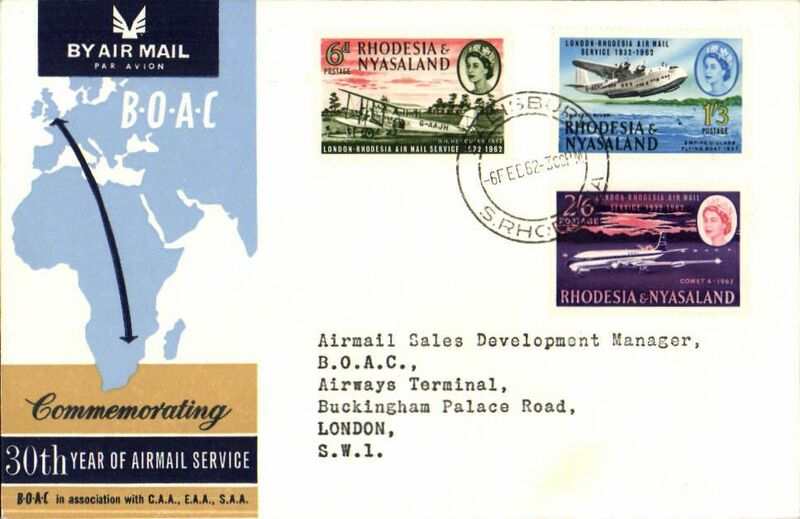 Rhodesia and Nyasaland Airways, carried to England, Ibstock 18/10 arrval ds on the front on the first internal flight, Umtali to Salisbury on Salisbury-Beira route, b/s 5/10, Wyndham cover franked 6d, canc Umtali cds, etiquette, typed 'First Air Mail Flight/Umtali to England'. At Salisbury it would have connected with Flight No AN 280 on the 9th arriving at Croydon on the 17th. Only 15 flown from Umtali to Salisbury. Francis Field authentication hs verso. A superb item in fine condition. 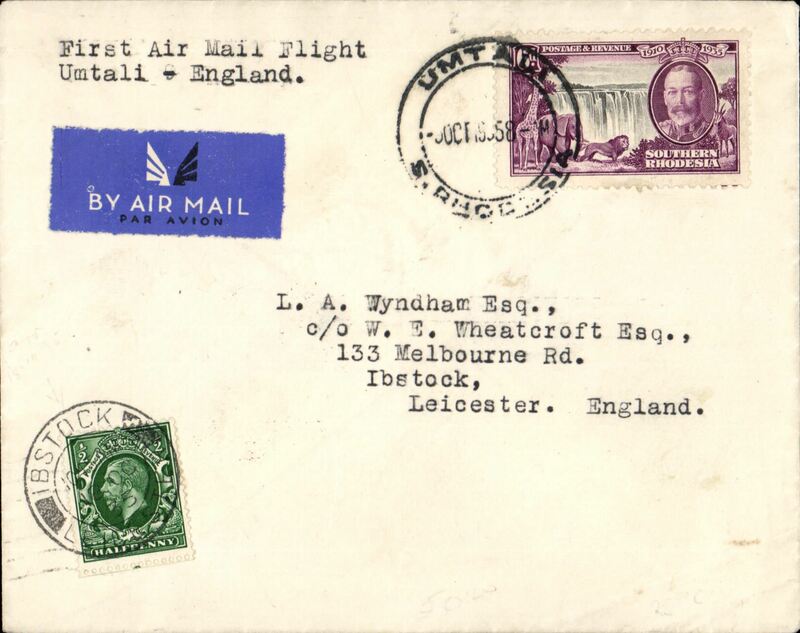 Umtali to London, 19/19 Ibstock arrival cds on front, carried on the Rhodesia and Nyasaland Airways first internal flight from Umtali to Salisbury, b/s 5/10, Wyndham cover franked 6d, canc Umtali cds, airmail etiquette, typed 'First Air Mail Flight/Umtali-England'. Francis Field authentication hs verso. Only 15 flown. 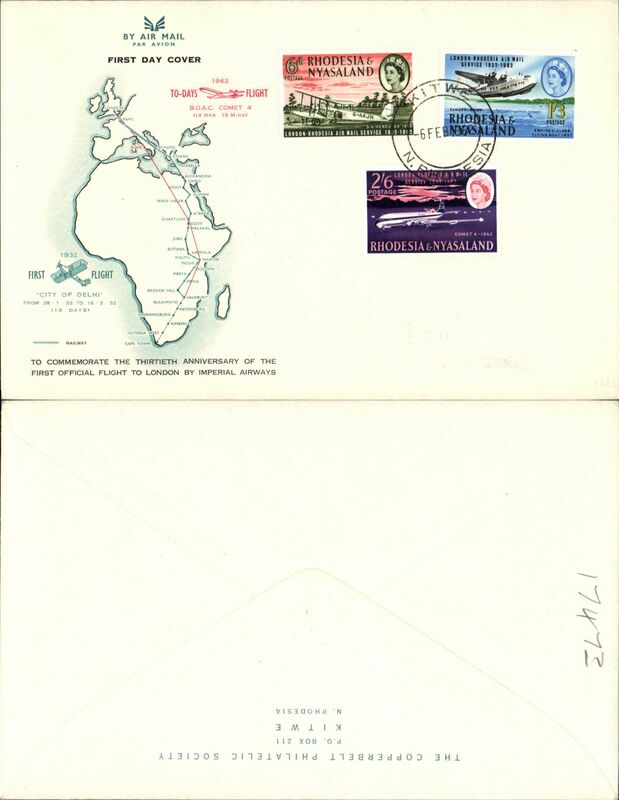 Rhodesia and Nyasaland Airways, F/F internal flight, Umtali to Salisbury on Salisbury-Beira route, b/s 5/10, Wyndham cover franked 4d, canc Umtali cds, etiquette, typed 'First Air Mail Flight/Umtali to Salisbury'. Only 15 flown. 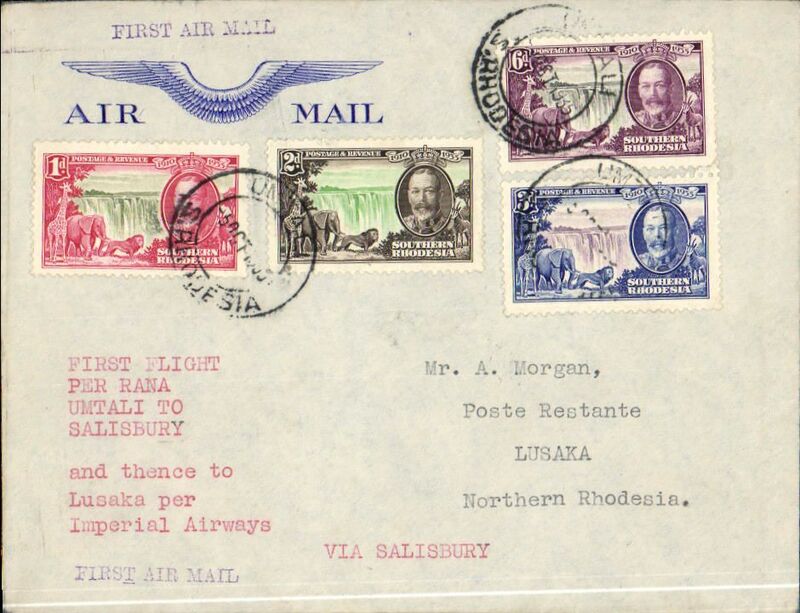 Scarce Umtali to Lusaka, bs 9/10, carried on RANA F/F, Umtali to Salisbury, bs 5/10 on the Salisbury-Beira route, and on to Lusaka, bs 9/10, by Imperial Airways. Attractive blue/grey embossed winged 'Air Mail' corner cover franked 1935 Silver Jubilee set of 4. Only 10 flown on F/F from Umtali to Salisbury, therefore even scarcer to Lusaka. 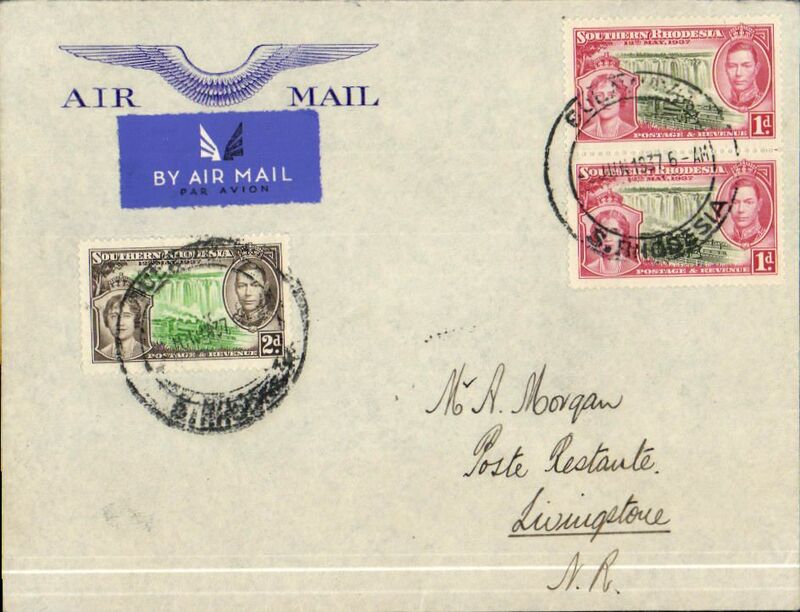 Scarce RANA F/F internal flight, Umtali to Salisbury on Salisbury-Beira route, b/s 5/10, imprint airmail cover franked 4d. Only 15 flown. Likely first acceptance of mail from Northern Rhodesia for the Middle Congo, Broken Hill to Brazzaville, bs 2/12, via Elisabethville 29/11, H.J.Davidson cover franked Silver Jubilee set of four, canc Broken Hill cds. In November 1935, Sabena/Air Afrique extended their joint Europe-Congo service as far as Elisabethville. At the same time Regie Malgache opened the Elisabethville-Madagascar service via Broken Hill. The involvement of L.J.Davidson in the preparation of this cover may also be significant, particularly as there is also a Francis Field authentication hs verso. An interesting challenge for the specialist. 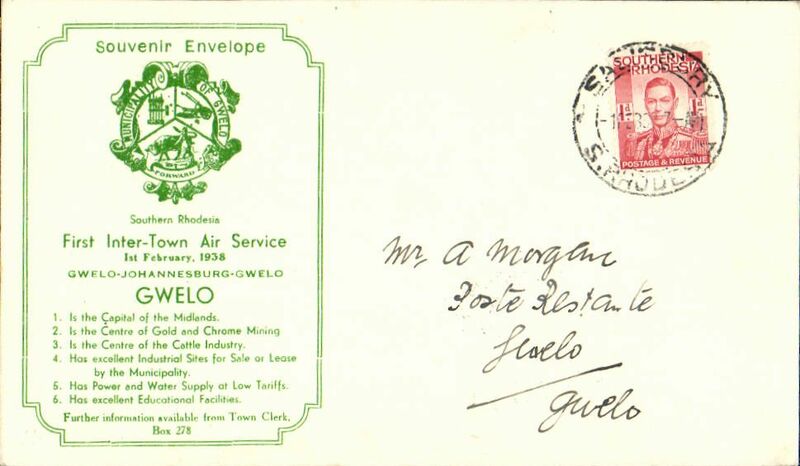 Regie Malgache/Imperial Airways, Elisabethville to Bulawayo, via Broken Hill 7/12, commercial airmail corner cover addressed to The Beira, Mashonoland and Rhodesia Railways, and franked 5.50F, regular feeder service to Broken Hill, then IAW to Bulawayo. 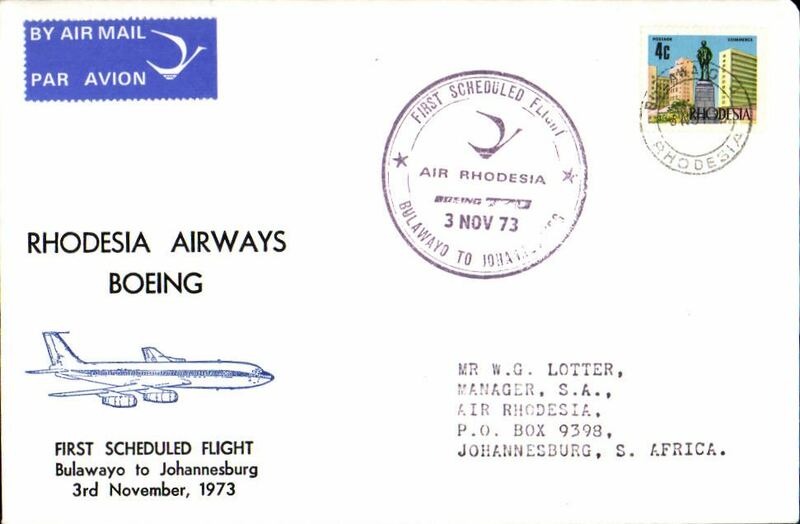 F/F Bulawayo to Livingstone leg of first regular Jo'burg-Lusaka service, b/s 9/6, IA printed cover with blue winged logo in top lh corner, flown by SAA over that portion of Imperial Airway's former route and thus the first external flight of South African Airways. Scarce, only 25 flown on Rhodesian stages of this route. 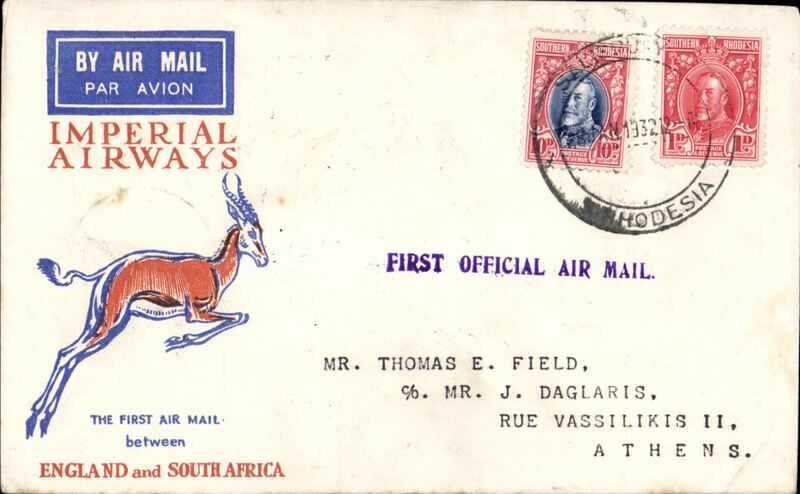 SAA inauguration of new service over the Imperial Airways former route from Lusaka to Johannesburg, bs 12/6, airmail etiquette cover franked 8d.. These were the first external flights of South African Airways. 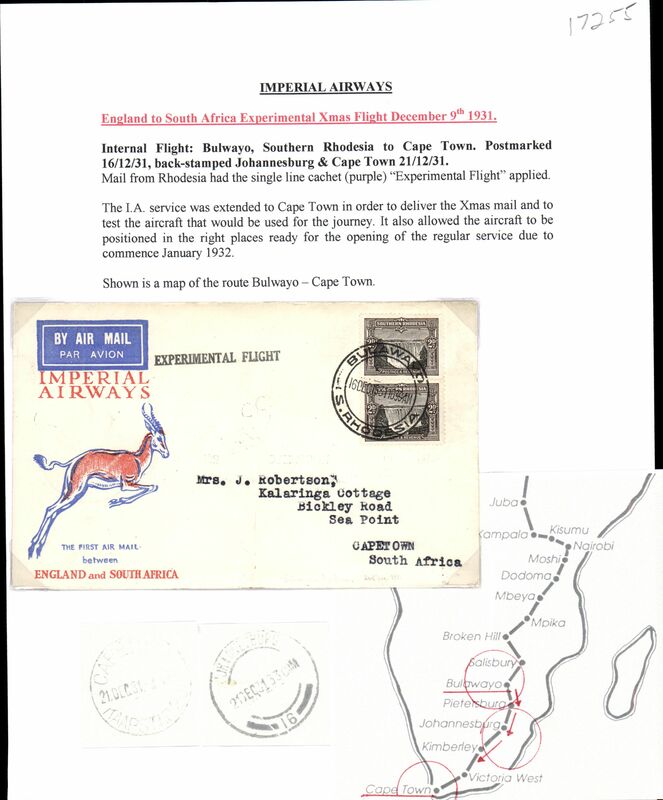 SAA inauguration of new service over the Imperial Airways former route from Johannesburg to Livingstone, b/s 11/6, via Lusaka 9/6, plain cover franked 4d, canc Johannesburg cds, also tying blue/white airmail etiquette.. 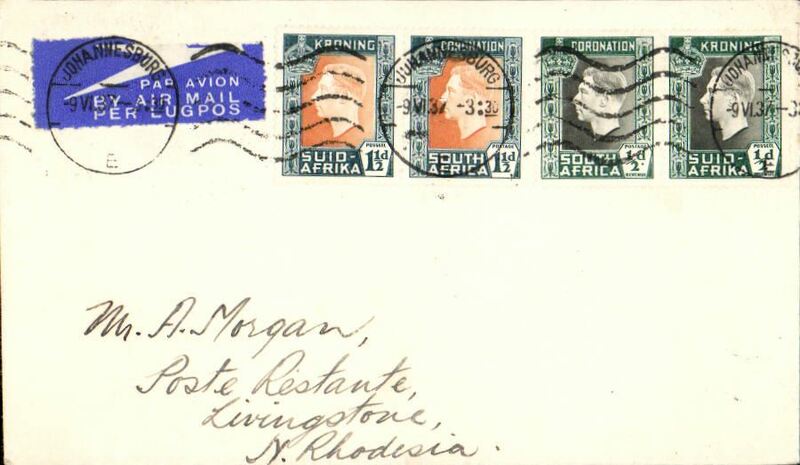 These were the first external flights of South African Airways.Francis Field authentication hs verso. 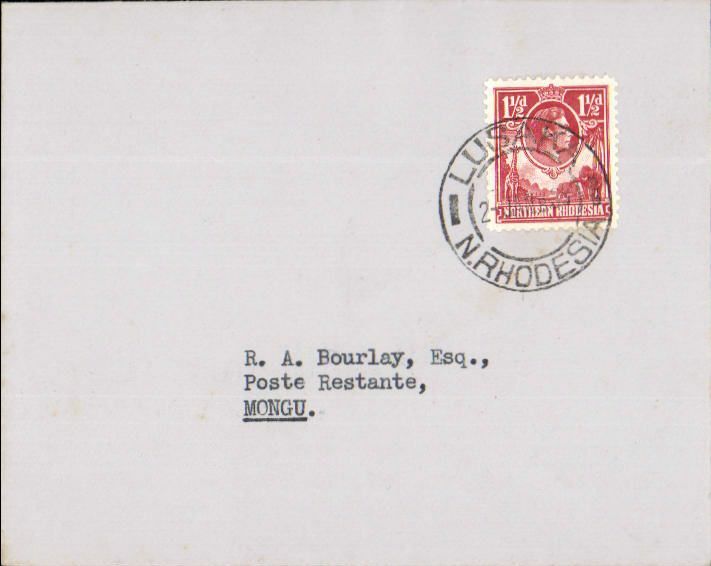 Inauguration of 1st stage of the Empire ir Mail Scheme, Bulawayo to Strand, Cape Province, bs 2/7 verso, cream/white souvenir cover printed "Southern Rhodesia/Inauguration Flight/Postal Rate to Great Britain/and African Colonies/2d per half-oz/30th June 1937", Uncommon. 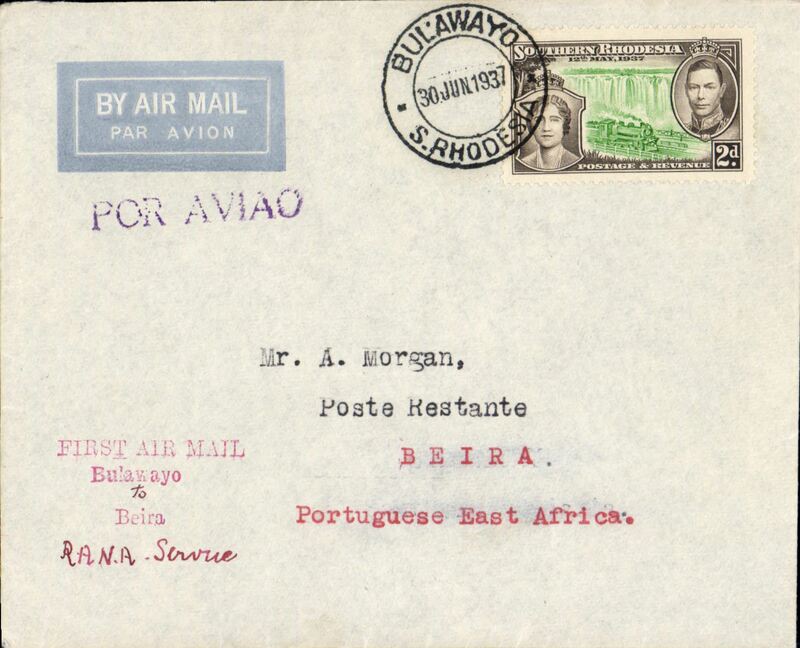 First direct flight Bulawayo to Beira by RANA to Beira, b/s 30/6, red three line cachet, violet "Por Avio" hs, printed etiquette cover franked 2d, Francis Field authentication hs verso. This flight connected with the Flying Boat service from Durban but only 25 covers were flown to Beira (ref. Stern).This fight is recorded in but a few of the standard works of reference. 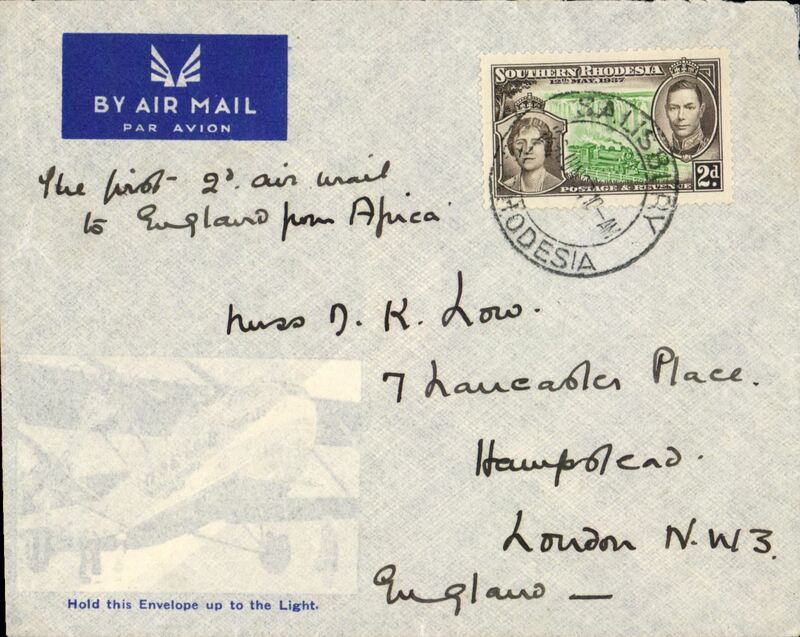 First acceptance for England for carriage on the new Empire Air Mail Scheme, Salisbury to London, souvenir 'Hold this Envelope up to the Light' cover showing picture of air liner Heracles, franked 2d, ms 'The First 2d air mail/to England from Africa'. 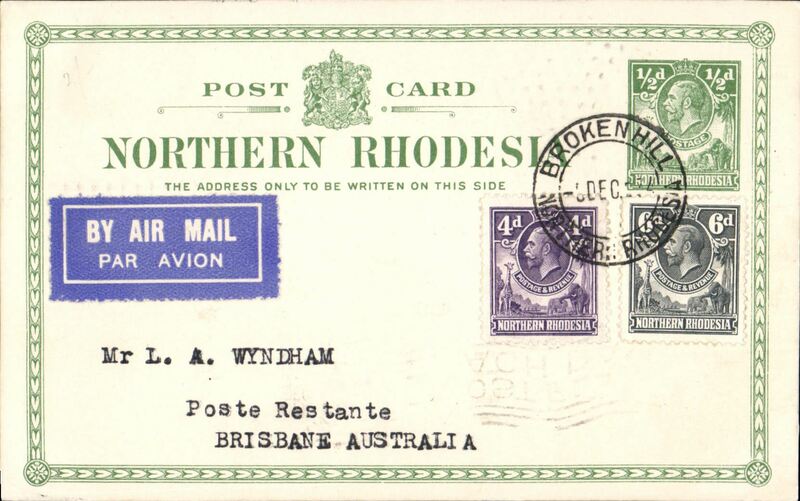 The Rhodesias and Nyasaland became participating countries in the Empire Air Mail Scheme at the end of 1937 with a rate of 2d per 1/2 oz.The majority of the other participating countries fixed their rate at 1 1/2 per 1/2 oz. 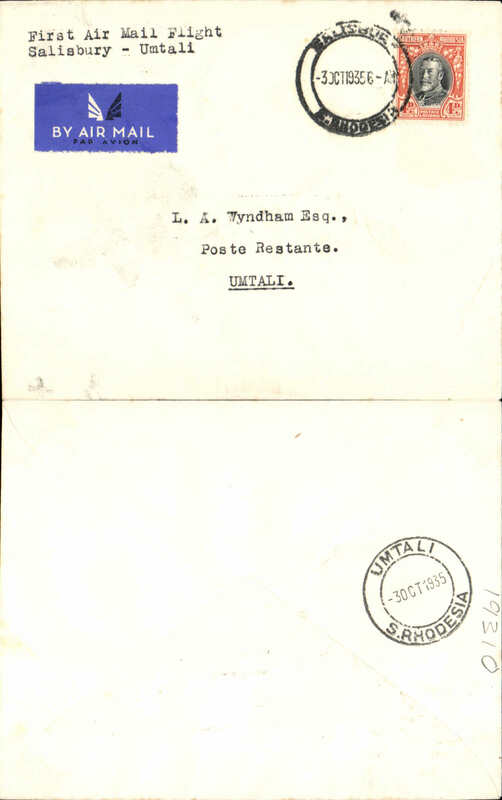 EAMS, first acceptance of mail for England under the Empire Airmail Scheme, carried on the F/F RANA Salisbury to Beira for carriage on the new Empire Air Mail Scheme, Salisbury to London, bs oval Registered Blackheath 7 JY 37, attractive red/white/blue registered (label) souvenir cover with picture of biplane printed "First Day Cover/RANA/F/F to Beira carrying Airmail from Southern Rhodesia for London under EAMS", franked 6d, canc Salisbury cds. Attracrive item. 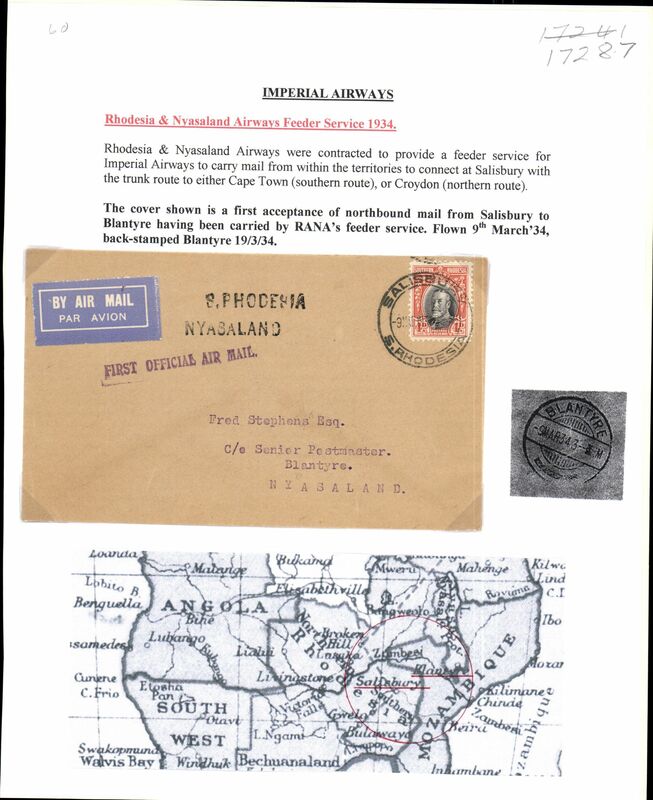 Inauguration of 1st stage of the Empire ir Mail Scheme, Bulawayo to London, immaculate IAW cream/blue souvenir cover with 'winged' logo franked 2d, large green printed 'Post In The Ordinary Letter Boxes/map of route' cachet. The Rhodesias and Nyasaland became EAMS participants at a 2d per 1/2 oz rate compared with everyone else at 1 1/2d. 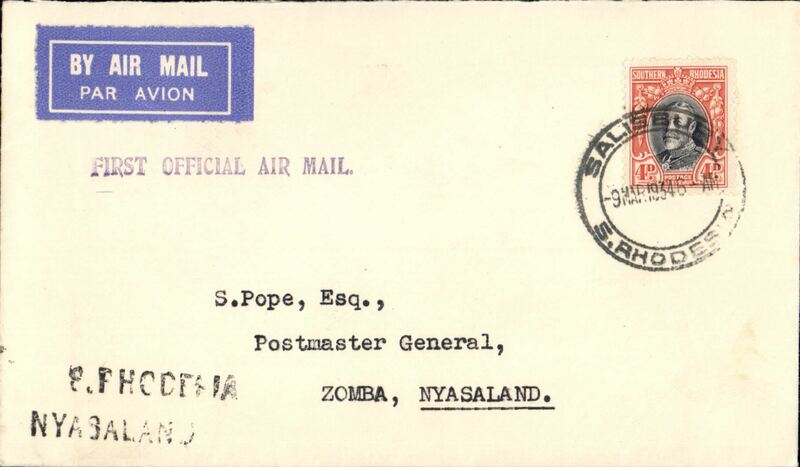 Inauguration of 1st stage of the Empire ir Mail Scheme, Bulawayo to London, bs 7/7, IAW cream/blue souvenir cover with 'winged' logo franked 2d, printed "Southern Rhodesia/Inauguration of 2d per half-oz/Air Mail Postal Rate/30th June 1937". The Rhodesias and Nyasaland became EAMS participants at a 2d per 1/2 oz rate compared with everyone else at 1 1/2d. 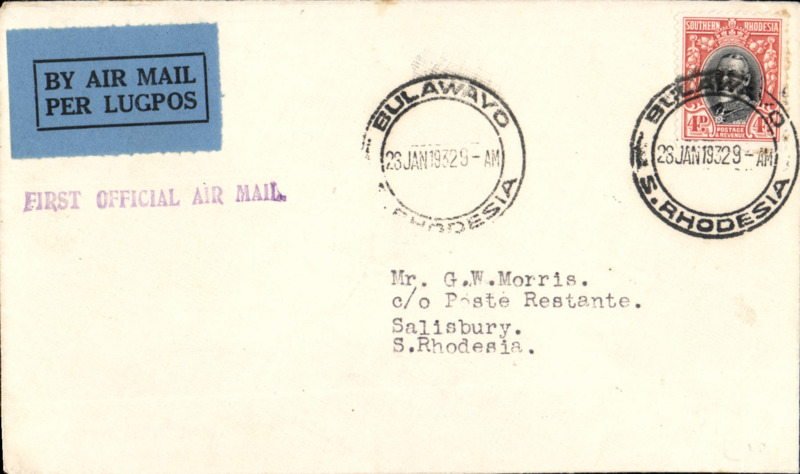 Rhodesia and Nyasaland Airways, F/F Salisbury to Gwaelo, bs 2/2, green/cream souvenir cover printed "First Intertown Air Service/1st February 1938/Gwelo-Johannesburg-Gwelo", franked 1d, flown as far as Que Que as Gwelo airport was waterlogged. 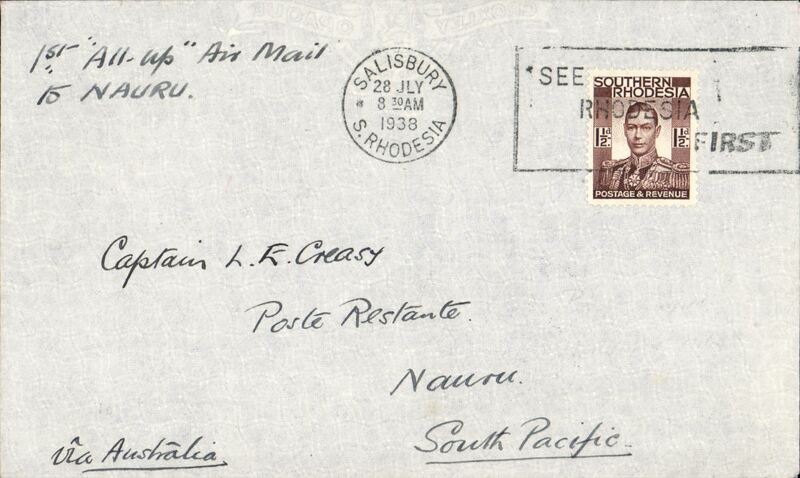 First acceptance of mail via Stage 3 of the Empire Airmail Scheme, Salisbury to New Guinea, bs Rabaul, NG, 11/8, via Townsville (Australia) 9/8, plain cover franked 1 1/2d, canc Salisbury cds. Flown by Rhodesia and Nyasaland Airways to Beira, then to Alexandria on the Imperial Airways Durban-Southampton flying boat service, then to Townsville on the IAW England-Australia service, and finally to Rabaul by WR Carpenter Airlines (see Aircraft Movements on Imperial Airways' Eastern Route, Vol 2 ,Wingent P, and Airmails of New Zealand, Vol 2, Walker DA). A superb example of the pleasure and fascination of aerophilately. 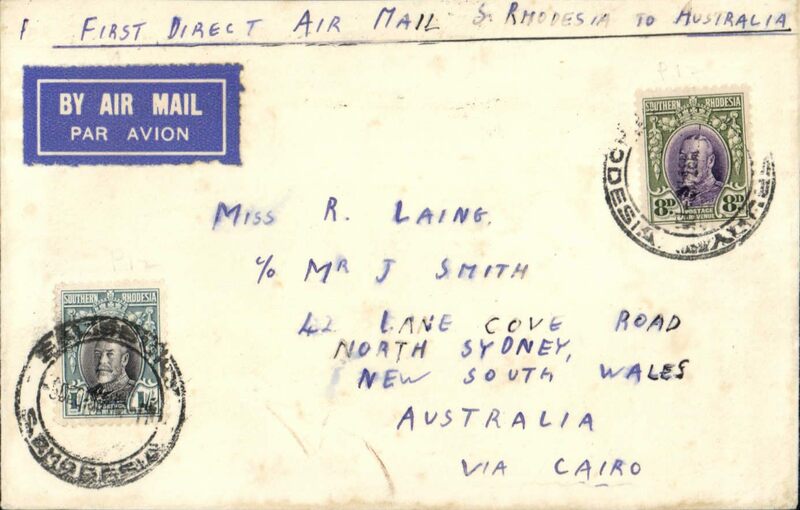 First acceptance of mail via Stage 3 of the Empire Airmail Scheme, Salisbury to Papua, bs Port Moresby, Papua, 10/8, via Townsville (Australia) 9/8, plain cover franked 1 1/2d, canc Salisbury cds. Flown by Rhodesia and Nyasaland Airways to Beira, then to Alexandria on the Imperial Airways Durban-Southampton flying boat service, then to Townsville on the IAW England-Australia service, and finally to Rabaul by WR Carpenter Airlines (see Aircraft Movements on Imperial Airways' Eastern Route, Vol 2 ,Wingent P, and Airmails of New Zealand, Vol 2, Walker DA). A superb example of the pleasure and fascination of aerophilately. 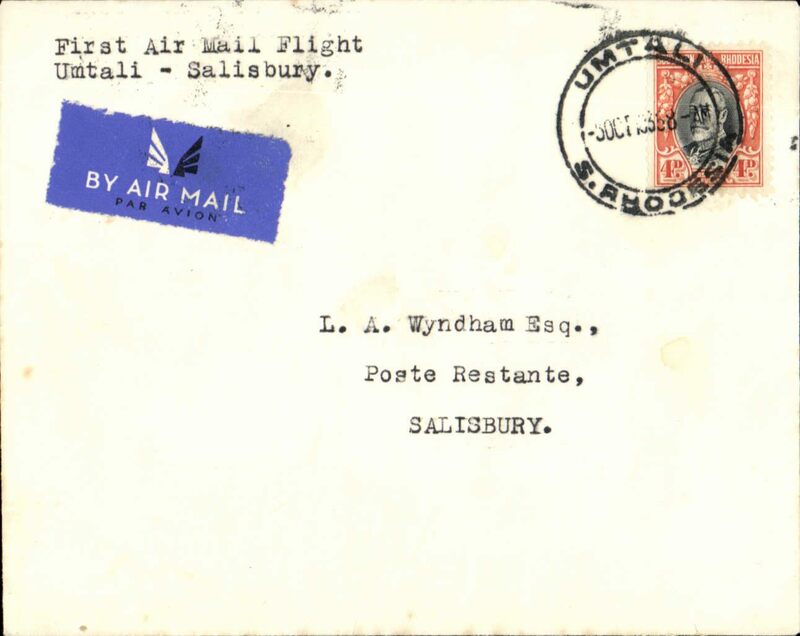 First acceptance of mail via Stage 3 of the Empire Airmail Scheme, Salisbury to Nauru, bs 25/8, plain cover franked 1 1/2d, canc Salisbury cds. Flown by Rhodesia and Nyasaland Airways to Beira, to Alexandria on the Imperial Airways Durban-Southampton flying boat service, to Townsville on the IAW England-Australia service, to Rabaul by WR Carpenter Airlines and, finally, by sea to Nauru (see Aircraft Movements on Imperial Airways' Eastern Route, Vol 2 ,Wingent P, and Airmails of New Zealand, Vol 2, Walker DA). A superb example of the pleasure and fascination of aerophilately. 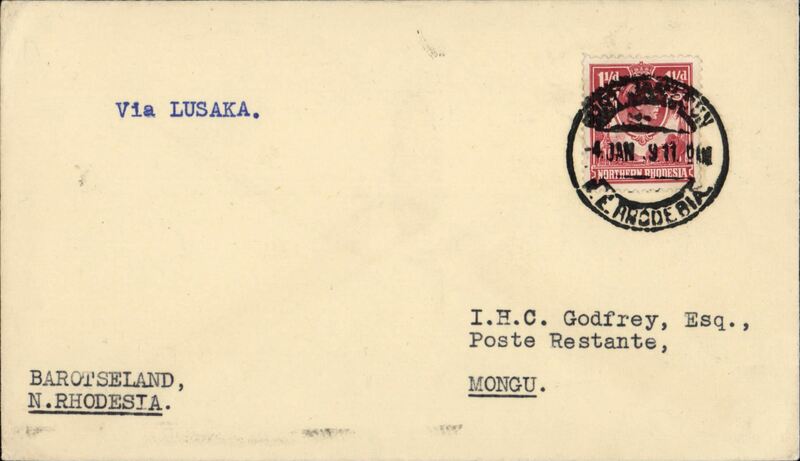 Barotseland's First Airmail, RANA,Lusaka to Mongu, bs 9/1,plain cover franked 1 1/2d, canc Lusaka/N. Rhodesia/2 Jan 1939. No advance publicity given, and no Postal Notice issued, for this flight. Mongu was one of the most isolated and desolate outposts of the British Empire with less than 50 European residents. 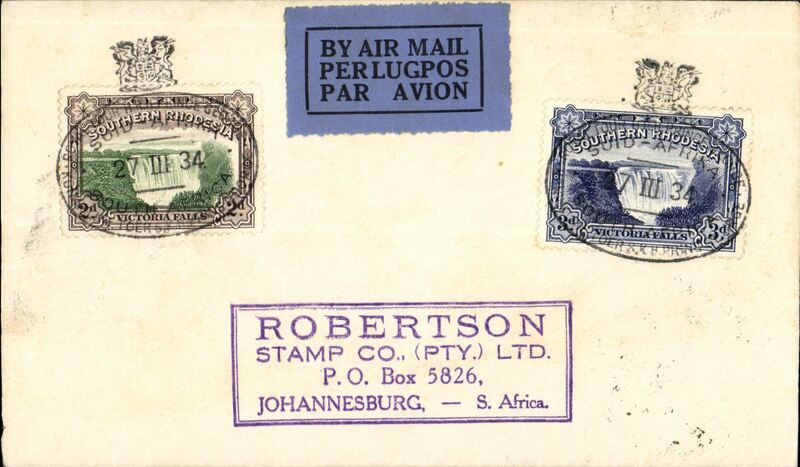 Only seven covers (all posted in Johannesberg) appear to have caught the first flight.The remainder believed, by Field, to be between 7-14, caught the second flight and, like this one were backstamped 9/1.A truly scarce item in fine condition. 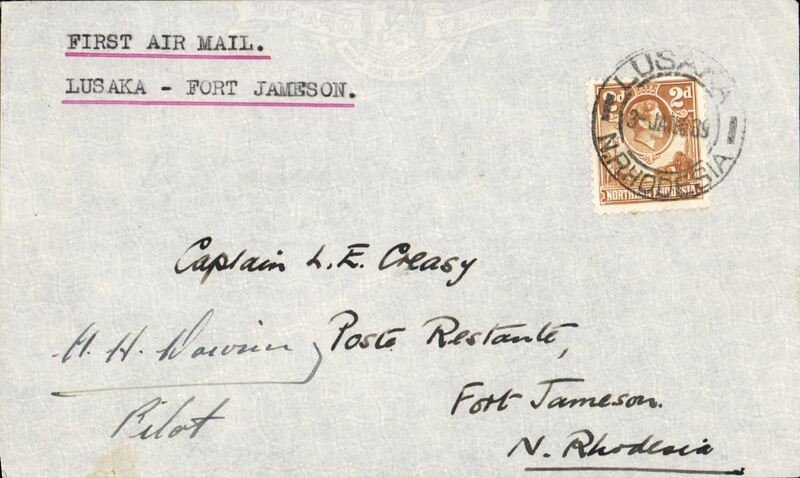 RANA first airmail Lusaka-Fort Jameson, bs 3/1, plain cover franked NR 2d canc Lusaka cds, typed 'First Air Mail/Lusaka-Fort Jamieson' and has been autographed by the pilot A.H. Downing. The addressee is Captain L.E. Creasy a highly respected aerophilatelist. Lusaka replaced Livingstone as the capital of Northern Rhodesia in 1935. A truly scarce item in fine condition. 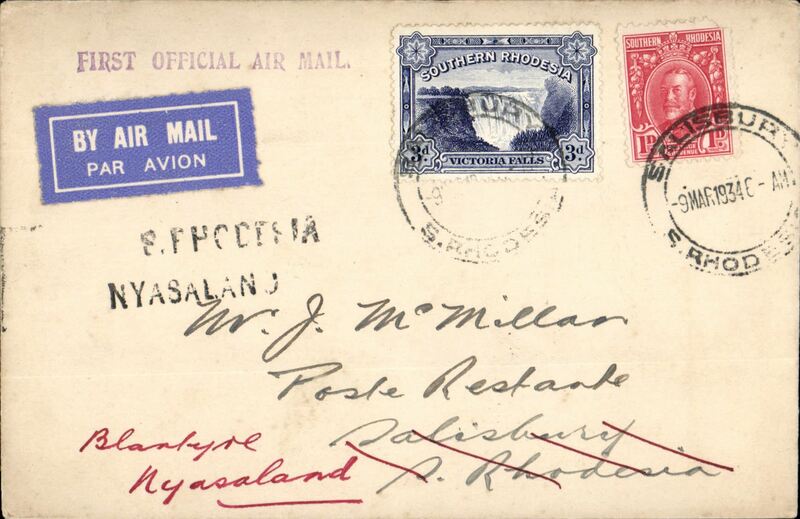 Barotseland's First Airmail, RANA, Fort Jamieson to Mongu, via Livingstone bs 13/1, plain cover franked 1 1/2d, canc Fort Jamieson/N. Rhodesia/4 Jan 1939, typed 'Via Lusaka'. Mongu was one of the most isolated and desolate outposts of the British Empire with less than 50 European residents. No advance publicity about the inaugural flight was given, and very little mail was carried - the bulk of the freight being bundles of bibles for mission stations, govt. stationary, and provisions for isolated settlers. All intended FFC's were carried on this the second flight.. A scarce item in fine condition. 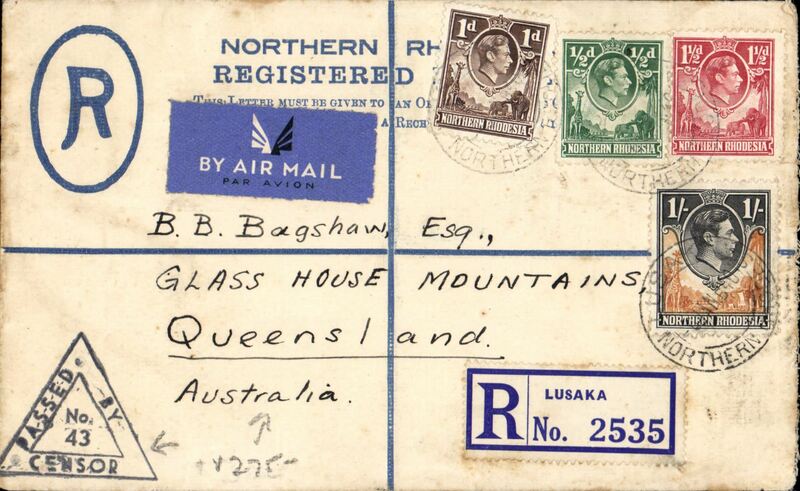 Northern Rhodesia to Australia, early censored WWII airmail Lusaka to Queensland via Darwin 21/1 and Brisbane 23/1, registered 4d PSE with additional 1/3d canc Lusaka 6 Jan 40 cds, airmail etiquette, Lusaka registration label. 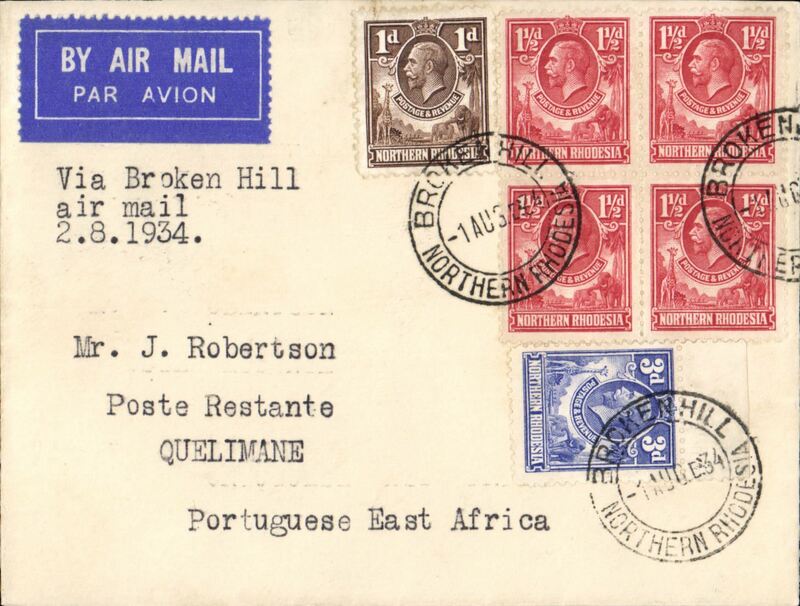 Wartime airmail out of Northern Rhodesia is difficult to find. 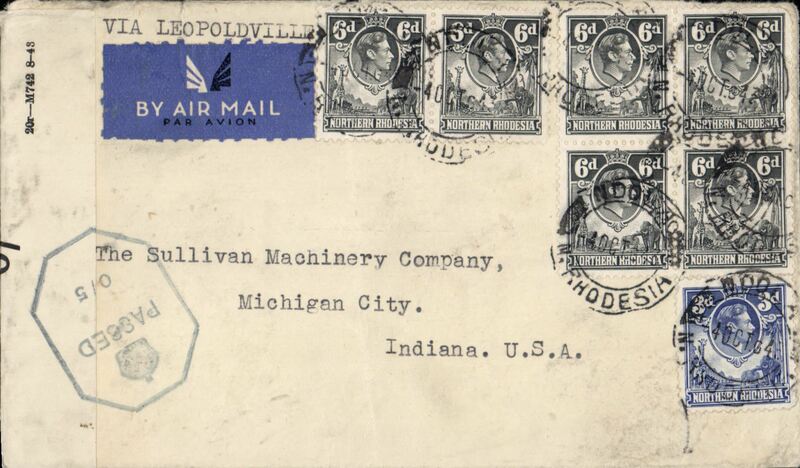 WWII censored airmail cover, Ndola to Michigan, USA, via the all air Pan Am FAM 22 West Africa-Brazil-Miami service, plain airmail etiquette cover, correctly rated 3/6d canc Ndola cds, typed 'Via Leopoldville', sealed B&W OBC O/ PC90 Southern Rhodesia censor tape, tied by blue hexagonal' Crown over Passed/05 SR censor mark. Carried by FAM 22 to Miami, then US internal air service to final destination. A nice wartime item. 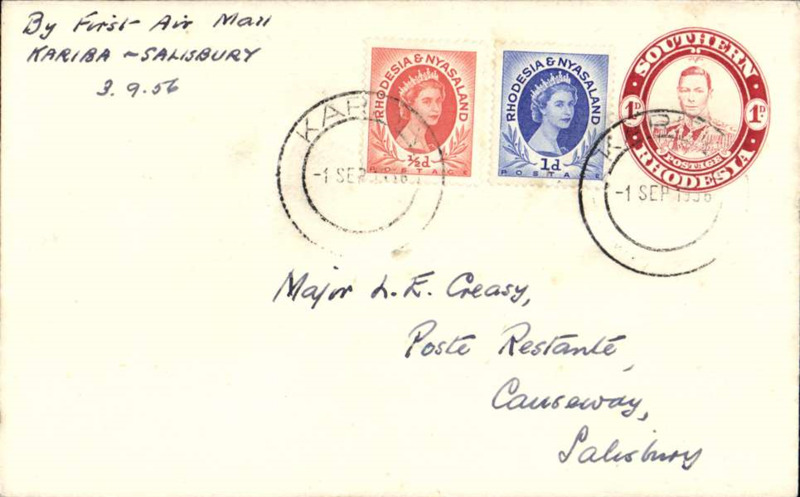 Airmail etiquette cover flown Southern Rhodesia to Czechoslovakia, franked KGV 1/-, cacnc Salisbury cds, bs Prague 29/9 arrival cds. Uncommon destination. 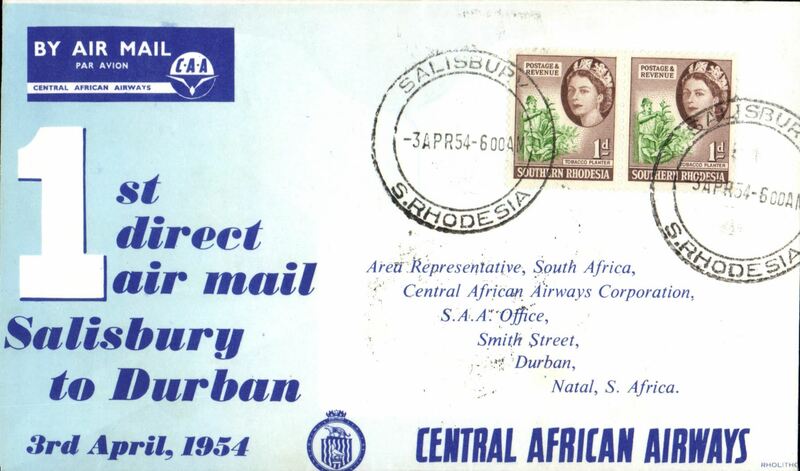 Central African Airways, first "Coastal Viking" direct Salisbury-Durban service, b/s, official souvenir cover. offering a fast, direct service to the South African coast. Attractive 'Zambezi' service vignette verso. 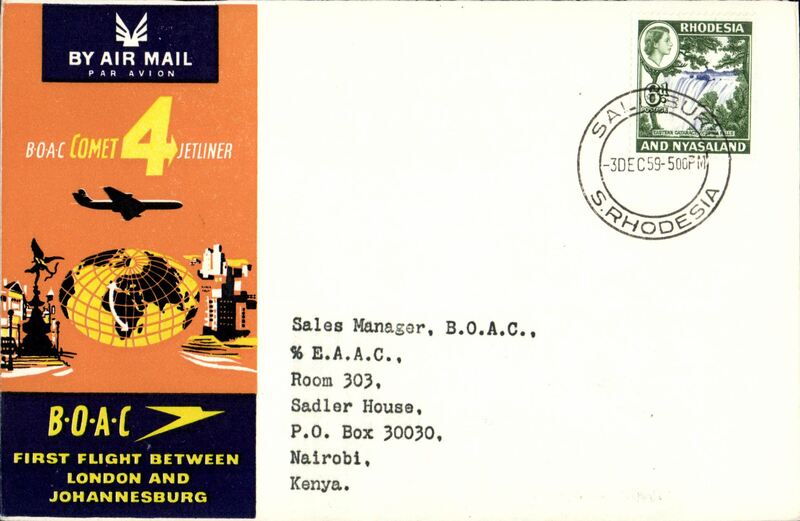 East African Airways, first direct flight between Dar es Salaam, souvenir cover franked 6d. 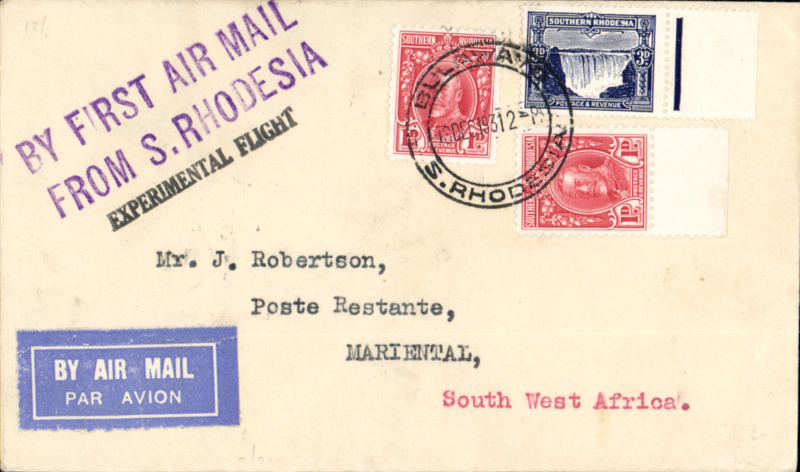 Central African Airways, F/F Salisbury to London by Rhodesian Viscount, bs 21/7 blue/white souvenir cover franked 1/3d. Fist flight Kariba to Salisbury, bs 4/9, 1d Southern Rhodesia PSE with additional 1 1/2d Rhodesia & Nyasaland stamps canc Kariba 1 Sep 19566 ds, ms 'By First Air Mail/Kariba-Salisbury/3-9-56". The inaugural flight marked the opening of the Kariba Post Office to serve the needs of workers on the dam project. The service was operated by Hunting Clan (Africa) Airways and, to date, only 12 covers ex Kariba on this date, have been traced, An exhibition gem in fine condition. 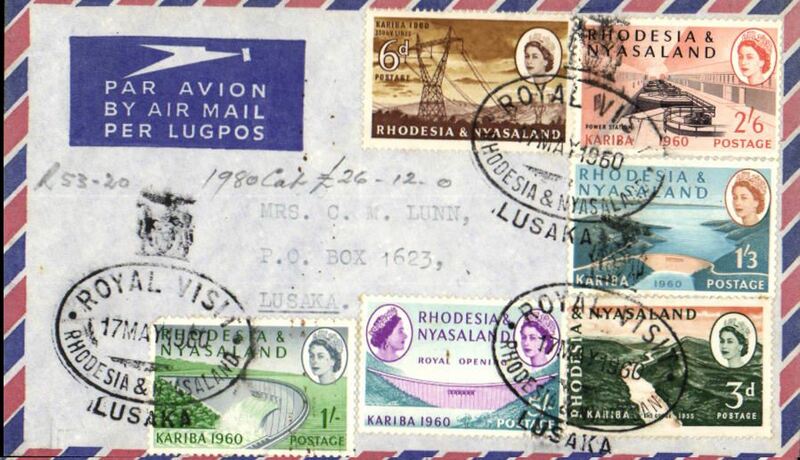 Northern to Southern Rhodesia, F/F Lusaka to Kariba, bs 3/9, 1d Southern Rhodesia PSE with additional 1 1/2d Rhodesia & Nyasaland stamps canc '** Northern**Sep***' cds, ms 'By First Air Mail/Lusaka-Kariba/3-9-56". This inaugural flight marked the opening of the Kariba Post Office to serve the needs of workers on the dam project. The service was operated by Hunting Clan (Africa) Airways. To date we have been unable to find any record of an incoming flight to Kariba from Lusaka on this opening date. So we believe it is extremely rare. An exhibition gem in fine condition. Three unused Air letters, Rhodesia Nyasaland QEII 6d (2), one CTO, and a Southern Rhodesia QEII 6d. 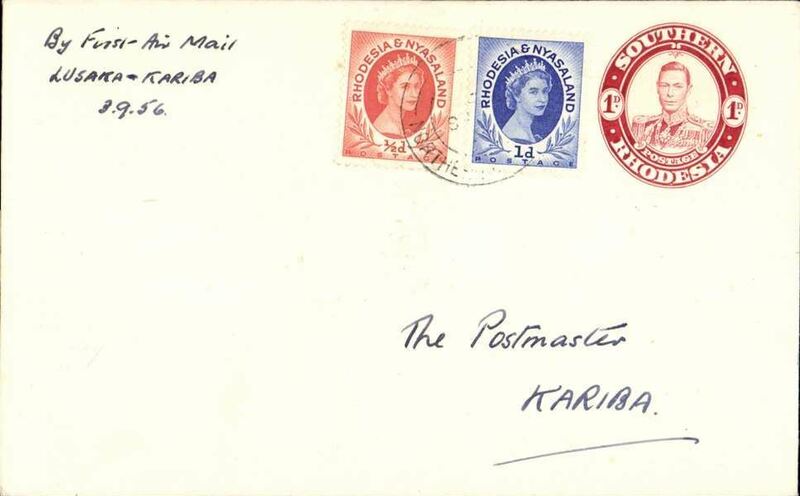 BOAC Comet 4 F/F Salisbury to Nairobi, bs 4/12, souvenir cover franked 6d. 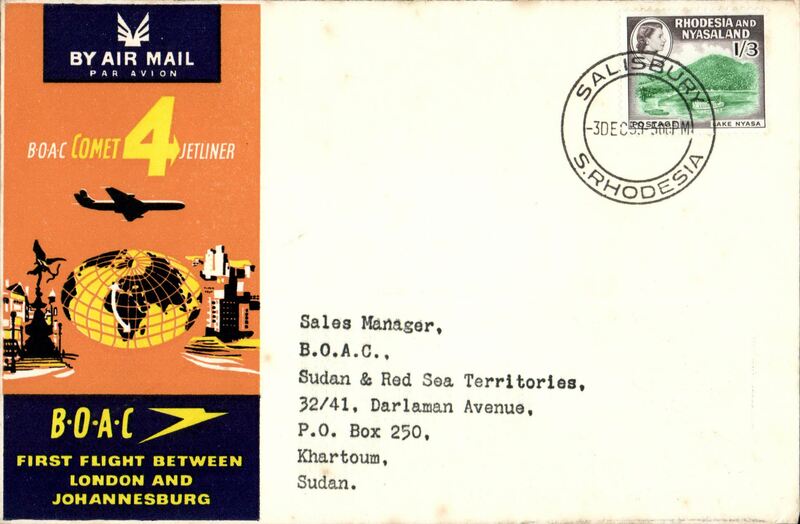 BOAC Comet 4 F/F Salisbury to Khartoum, bs 4/12, souvenir cover franked 1/3d. 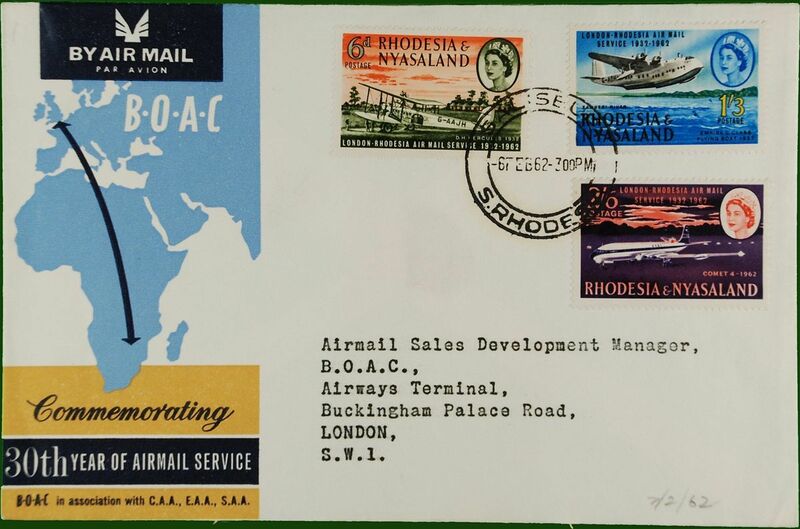 BOAC Comet 4 flight, Kitwe to London, no arrival ds, to commemorate the 30th anniversary of the London-Rhodesia airmail service, red/green/cream souvenir cover with map of rote, franked FDI 30th anniversary set of 3, canc Kitwe cds. F/F British United Airways VC10, Salisbury to London, attractive souvenir cover. Uncommon. 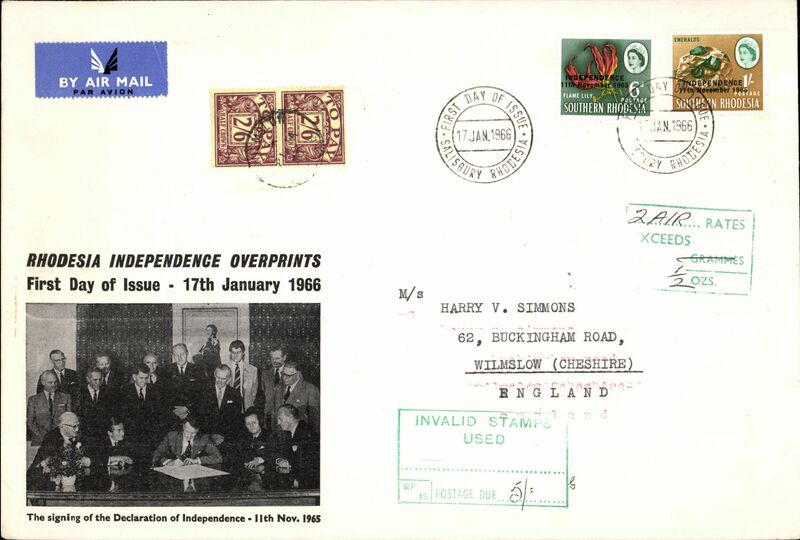 Large illustrated airmail first day cover franked independence 6d & 1/- values (Stanley Gibbons numbers 364 & 366) from Salisbury to Wilmslow, England, posted after the unilateral declaration of independence & stamps not accepted for postage by the British authorities, with green inland section "invalid stamps/used/postage due 5/-" cachet applied and also green instructional "2 air rates/exceeds/½ ozs. ", with pair of British 2/6d postage dues affixed & tied by Wilmslow cds of 21 January, typed address. Remarkably fine & clean for these large envelopes A superb piece of UDI mail. Airmail cover franked independence 1/2d to 1/3d (8 vals), posted after the unilateral declaration of independence & stamps not accepted for postage by the British authorities, with green inland section "invalid stamps/used/postage due (ms 2/6d)" cachet applied with 5x6d British postage dues affixed & tied by Newton Abbot cds. A nice piece of UDI mail. 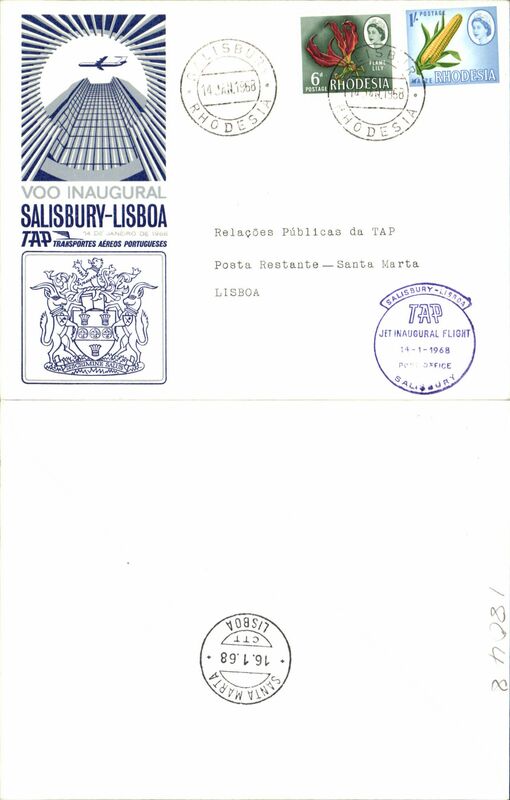 TAP F/F Salisbury to Lisbon, bs 16/1, franked 1/6d, special crested blue flight cachet, blue/white souvenir cover. 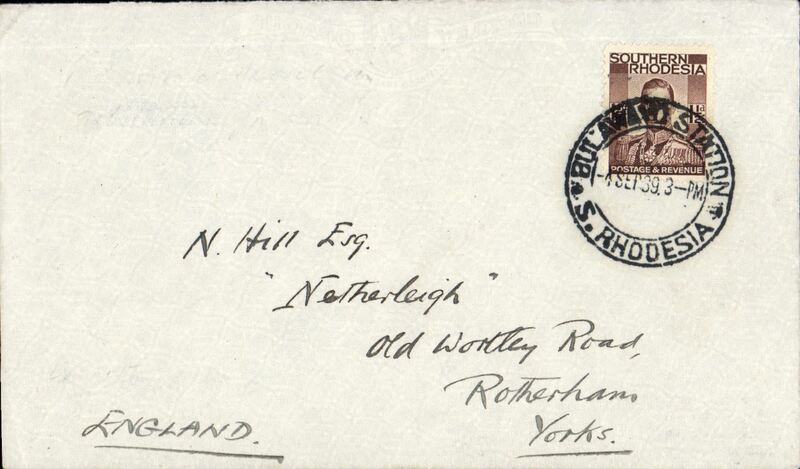 Airmail cover to England franked 2 1/2c & 12 1/2c 1970 new decimal currency issued in Februry 1970 and cancelled …. 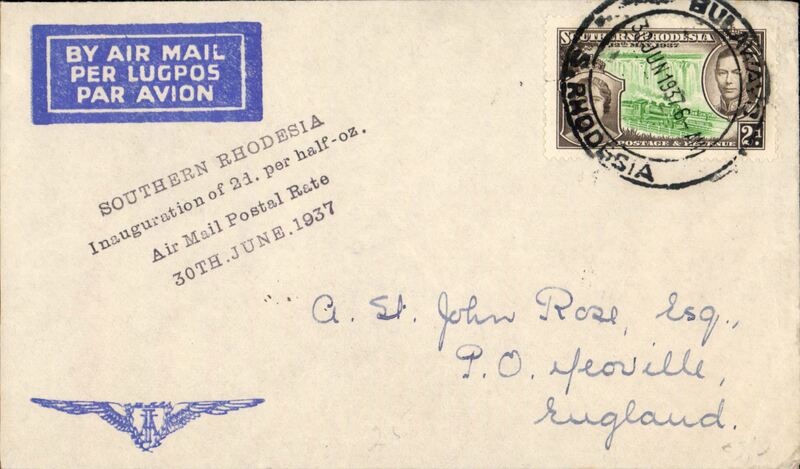 'Rhodesia' machine cancel (date illegible). 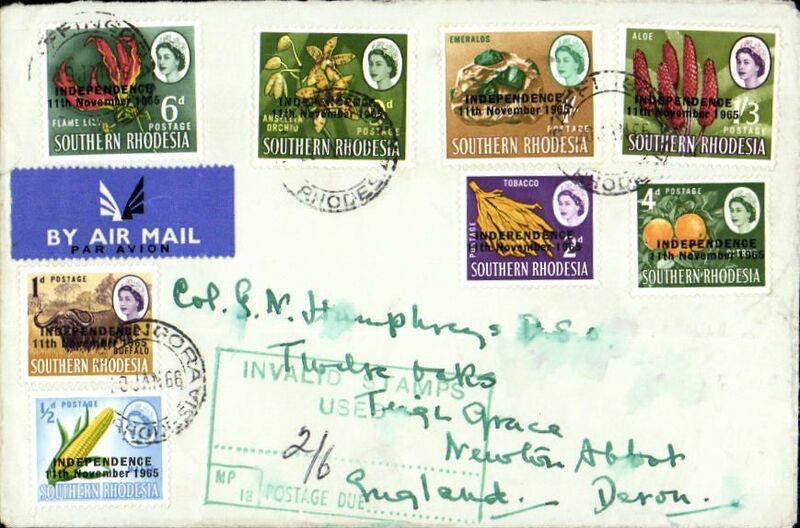 On arrival in Britain 2x6d & 2/6d postage dues were affixed and cancelled, also a red/white label "Southern Rhodesia Stamps/The Goverment has announced/that stamps issued in Rhodesia of the kind used on this postal packet/have no legal basis/The Packet is accordingly surcharged" and a green boxed '3/6/To Pay...' hs. The British goverment withdrew the embargo in Oct 1970. A scarce memento of a politically significant event, in fine condition. 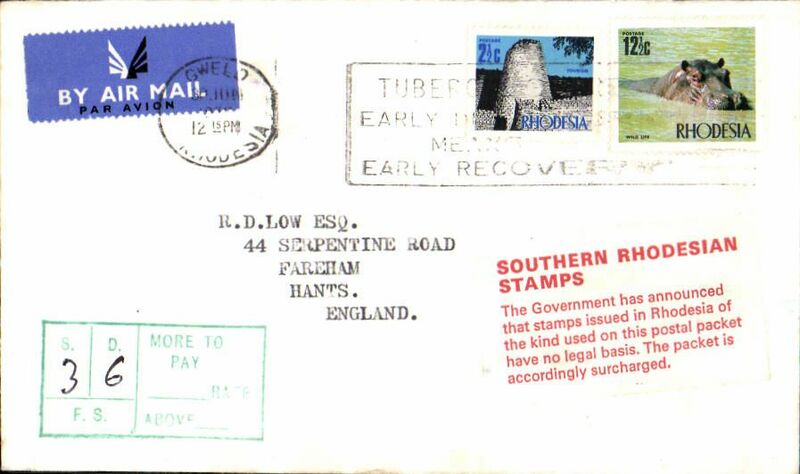 Airmail cover, 23x10cm, to England franked 25c,12 1/2c x5, 2 1/2c 1970 new decimal currency issued in Februry 1970 and cancelled …. 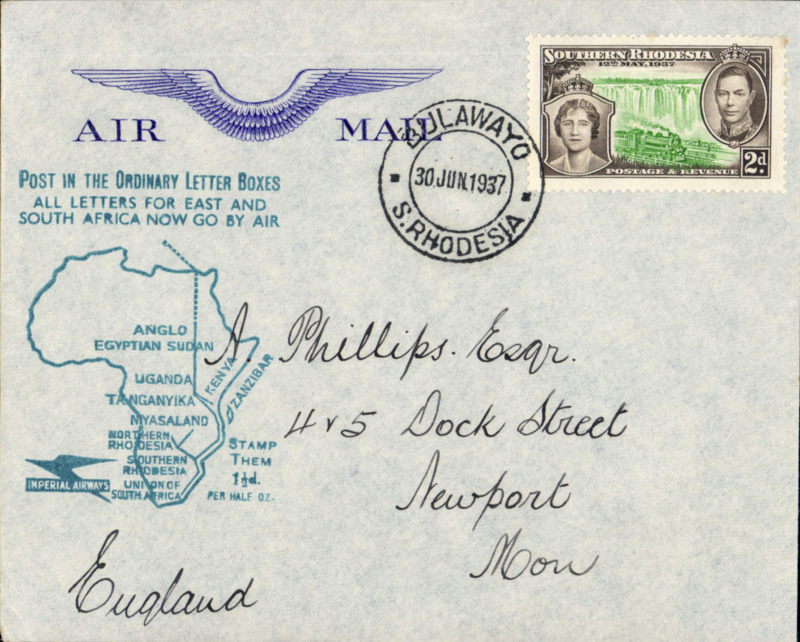 'Salisbury/Rhodesia dr cds, green straight line "Received By Airmail" hs. On arrival in Britain 6x 2/6d and 6x 1/- postage dues were affixed versoand tied with violet oval "Hyde......." cancellation, also on the front a red/white label "Southern Rhodesia Stamps/The Goverment has announced/that stamps issued in Rhodesia of the kind used on this postal packet/have no legal basis/The Packet is accordingly surcharged" and a green boxed "Invalid Stamps Used/Postage due (ms) 21s 0d". The British goverment withdrew this embargo in Oct 1970. A scarce airmail memento of a political event. Some corner scuffing and a couple of small non invasive closed edge tears, otherwise good. 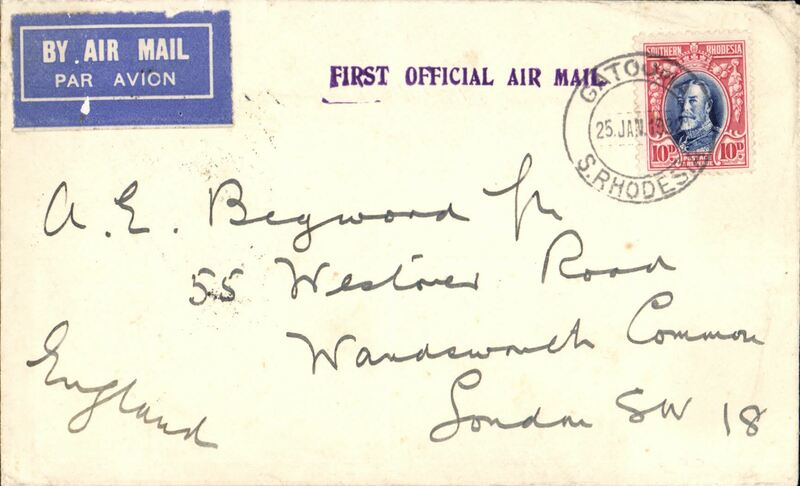 Airmail cover to London July 70 arrival ds on front, franked 8c new decimal currency issued in February 1970 and cancelled …. 'Rhodesia' machine cancel . On arrival in London 1/9d postage dues were affixed and cancelled, also a red/white label "Southern Rhodesia Stamps/The Goverment has announced/that stamps issued in Rhodesia of the kind used on this postal packet/have no legal basis/The Packet is accordingly surcharged" .The British government withdrew the embargo in Oct 1970. A memento of a politically significant event in fine condition. 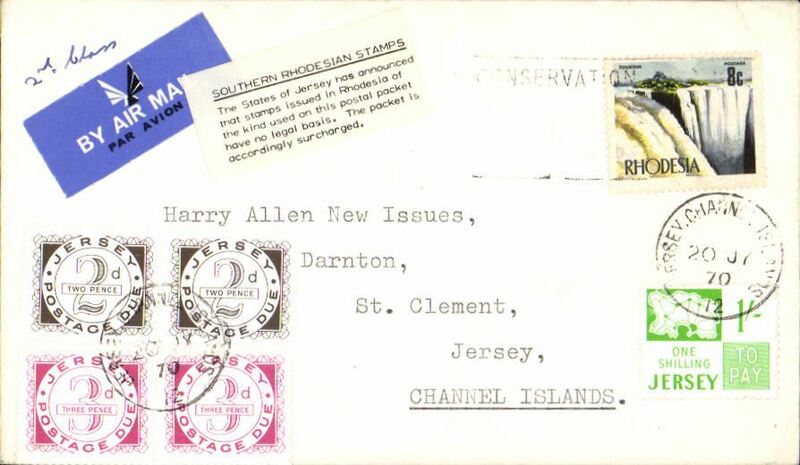 Airmail cover to Jersey, Channel Islands, 20 JY 70 arrival ds on front, franked 8c new decimal currency issued in February 1970 and cancelled …. 'Rhodesia' machine cancel (date illegible). On arrival in Jersey 1/10d postage dues were affixed and cancelled, also a black/white label "Southern Rhodesia Stamps/The Goverment has announced/that stamps issued in Rhodesia of the kind used on this postal packet/have no legal basis/The Packet is accordingly surcharged" .The British government withdrew the embargo in Oct 1970. A memento of a politically significant event, sent to an uncommon destination, A nice item in fine condition. 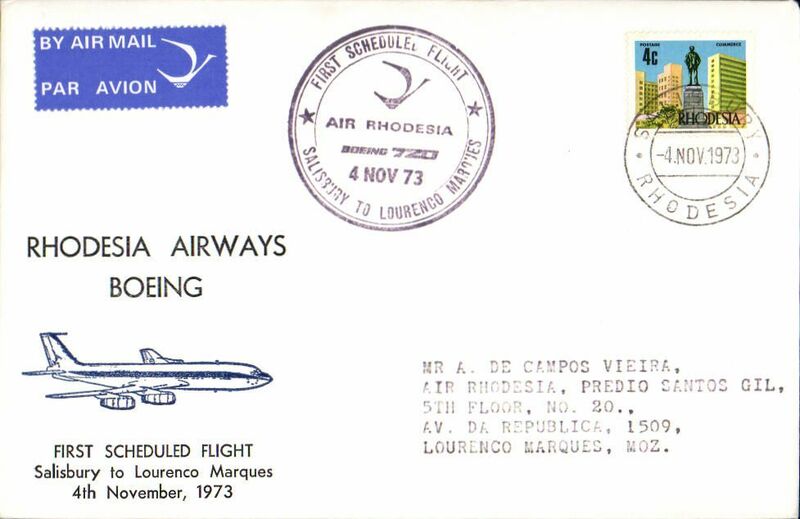 F/F Rhodesia Airways, Salisbury to Laurenco Marques, special 4/11 arrival fight cachet, blue/white souvenir cover with drawing of Boeing in flight, franked Rhodesia 4c, canc Salisbury Rhodesia cds. The permitted use of a Rhodesia stamp is significant, because around that time the UK refused to accept it as legal tender. 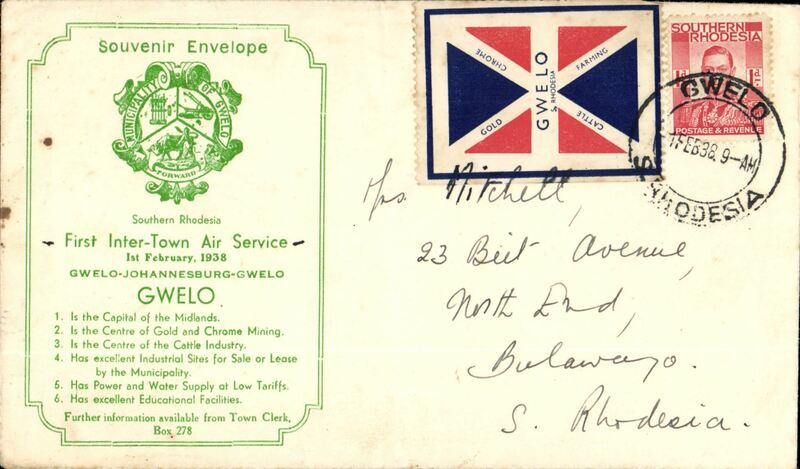 F/F Rhodesia Airways, Bulawayo to Johannesburg, special 4/11 arrival fight cachet, blue/white souvenir cover with drawing of Boeing in flight, franked Rhodesia 4c, cancBulawayo Rhodesia cds. The permitted use of a Rhodesia stamp is significant, because around that time the UK refused to accept it as legal tender.